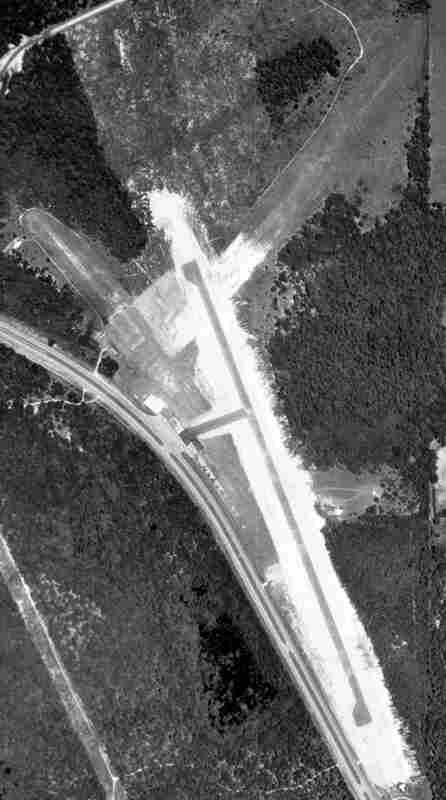 An admittedly low-quality 1994 aerial view looking southeast at the Panama City Beach Airfield. The specific name of the small private airfield on the north side of the town of Panama City Beach has not been determined. 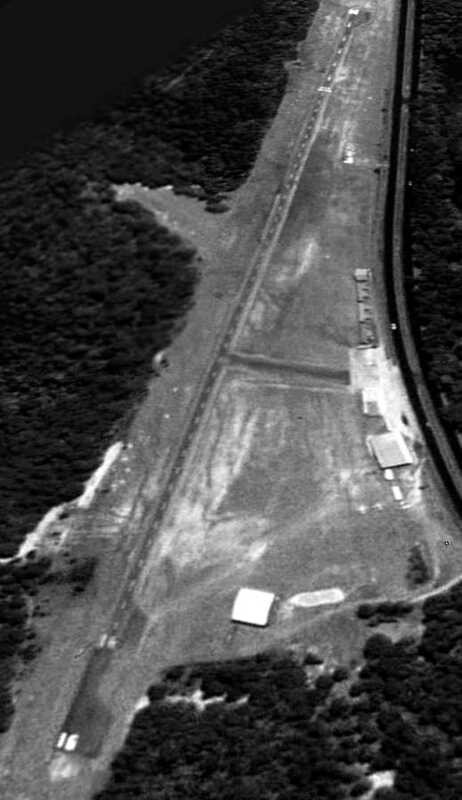 The airfield was not yet depicted on a 1979 aerial photo. 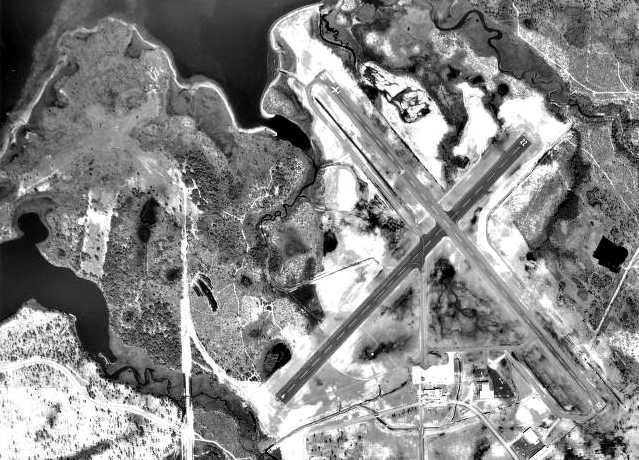 The earliest depiction which has been located of Panama City Beach Airfield was an 1994 aerial view. It depicted the field as having a single unpaved north/south runway, with a long hangar on the northwest side. Brian Beard recalled, “Panama City Beach Airfield... I used to setup the banners for towing there, and cracked up a Traumahawk [Piper PA-38 Tomahawk] in 1997. 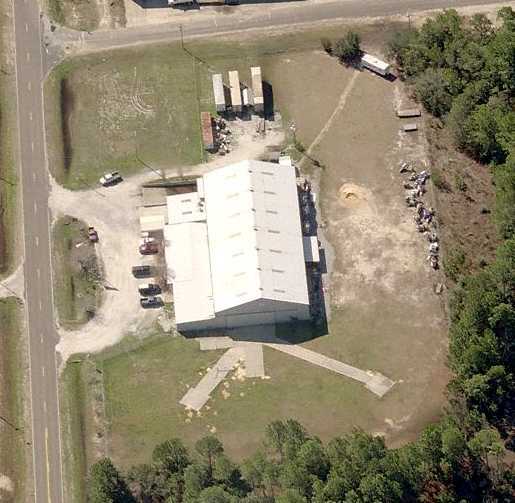 A 1999 aerial view showed 2 light single-engine aircraft next to the Panama City Beach Airfield hangar. showing the grass north/south runway, hangars, and several single-engine planes. Nick Kaplan recalled, “ I was a banner tow pilot back in 2003 at a small grass strip in Panama City Beach. The Company was called Aerial Ads of the Southeast. 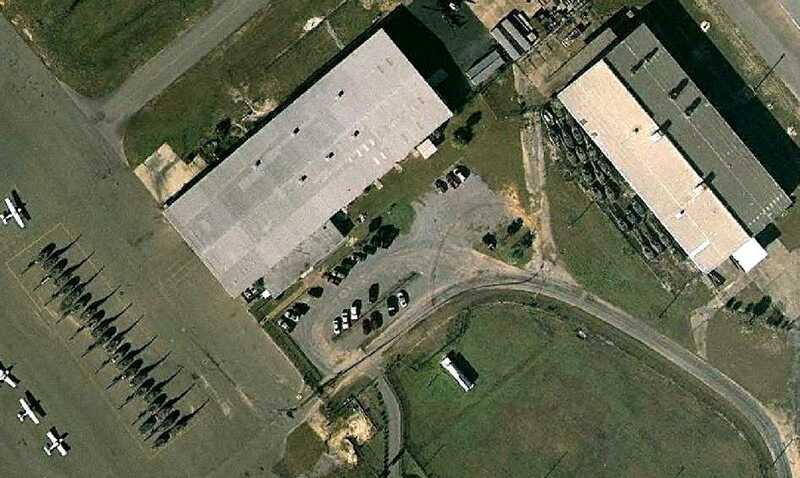 The trailers we lived in [were] next to the hangar. I had always logged it as simply PCB-A. I have lost touch with past co-workers & pilots, and the company no longer exists, nor do I remember the owners name. It was about 1,000' when the ground was dry, with a NNE/SSW runway. 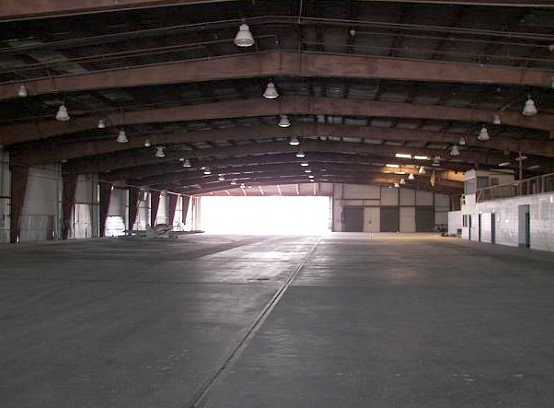 We had one open-aired hangar that could cover about 5 planes. The year I was there we towed with modified Cessna 150s, a Cessna 175 & Scouts, and had a [Piper] Pawnee that never ran. and grassy area for the banners to be laid out & picked up to the immediate west of the runway & the proverbial 50' obstacle (trees) on either end. A 3/9/03 aerial view by Nick Kaplan looking west at 2 Cessnas & several small buildings at Panama City Beach Airfield. A 3/9/03 photo by Nick Kaplan of a Cessna 172 preparing to depart from Panama City Beach Airfield. A 3/9/03 photo by Nick Kaplan of a Scout behind an aerial advertising banner ready for pickup at Panama City Beach Airfield. A 3/9/03 photo by Nick Kaplan of a Scout next to the shed hangars at Panama City Beach Airfield. 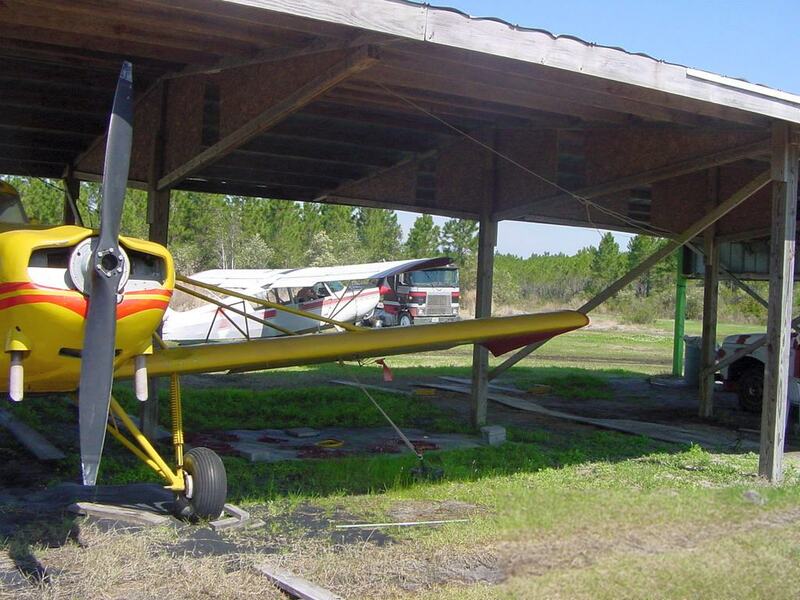 A 3/9/03 photo by Nick Kaplan of a Piper Pawnee & a Scout at Panama City Beach Airfield. A 3/9/03 photo by Nick Kaplan of the Panama City Beach Airfield runway, showing the poles used for pickup of an aerial advertising banner. which showed 1 single-engine aircraft on the field. 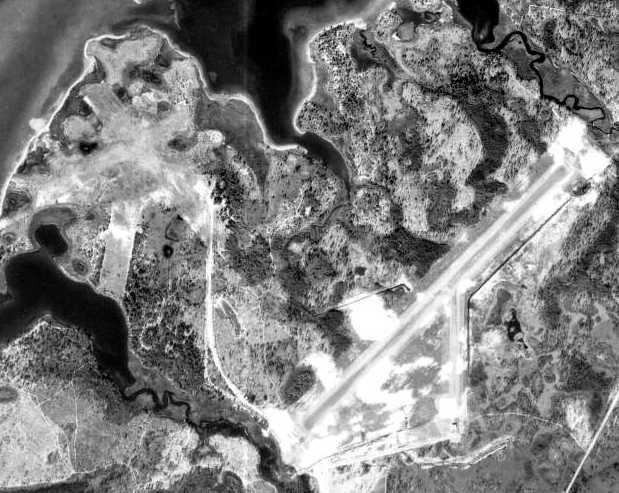 An 8/30/06 aerial view did not show any aircraft on the field at Panama City Beach Airfield. but there were no aircraft visible or other signs of recent aviation usage. but no airfield there is registered with the FAA as of 2015. 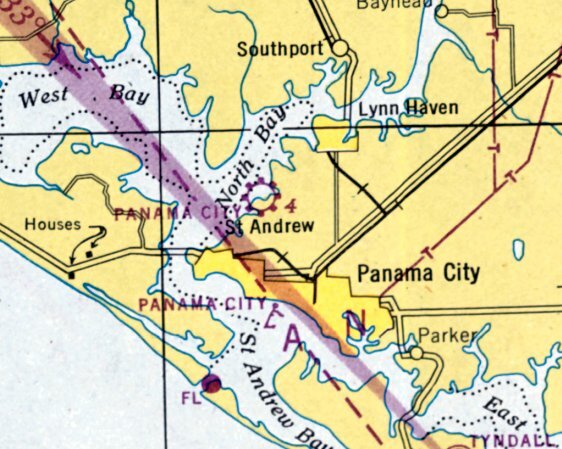 The site of Panama City Beach Airport is located north of the intersection of Panama City Beach Parkway & Art Coleman Road. Thanks to Nick Kaplan for pointing out this airfield. 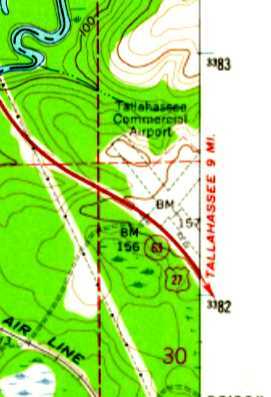 Tallahassee Commercial Airport, as depicted on the 1963 USGS topo map. 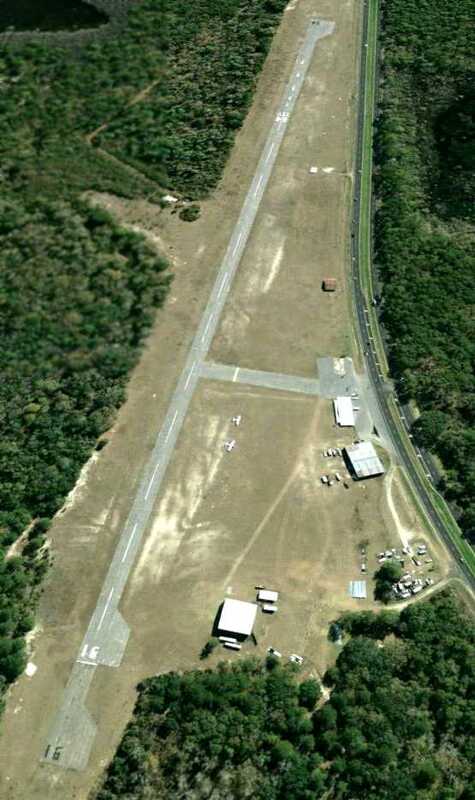 this small general aviation airport was established in October 1945. 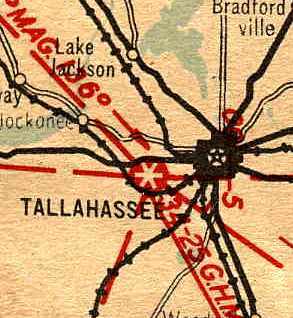 However Tallahassee Commercial Airport was not yet depicted on the 1949 Mobile Sectional Chart. 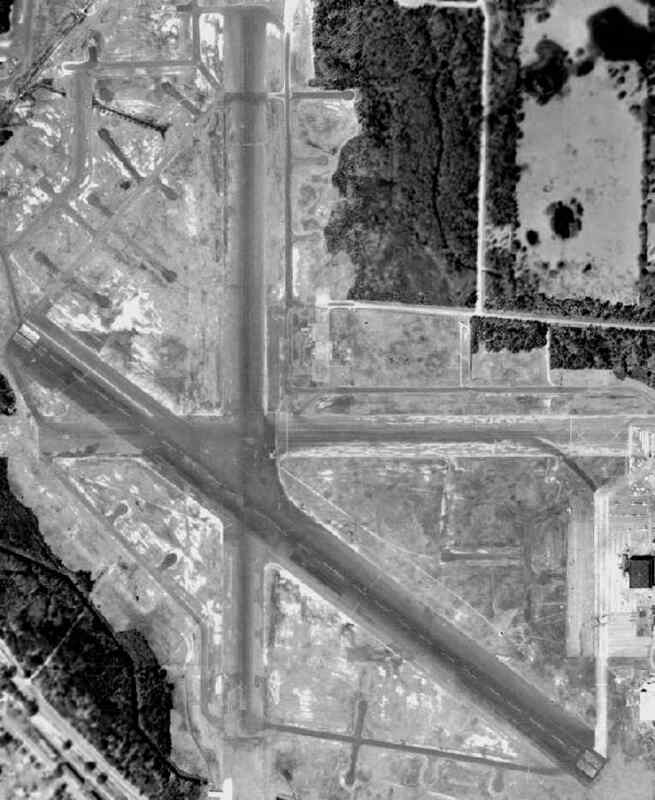 The earliest depiction which has been located of Tallahassee Commercial Airport was a 1952 aerial view. with a small building & a single-engine aircraft on the southeast side of the field. 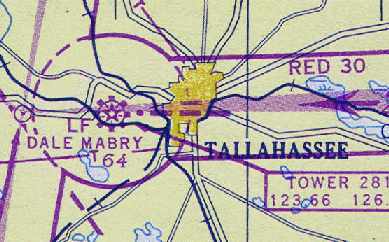 The earliest depiction which is available of Tallahassee Commercial Airport was on the 1963 USGS topo map. 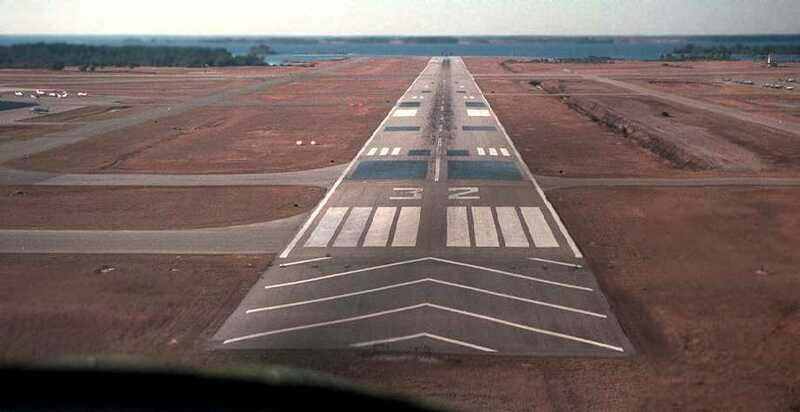 It depicted Tallahassee Commercial as having 2 unpaved runways. 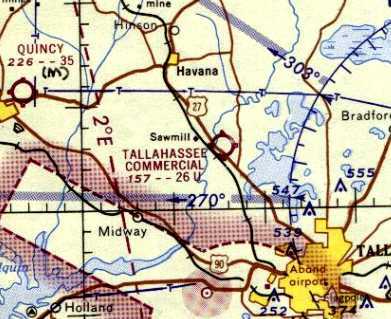 The earliest aeronautical chart depiction has been located of Tallahassee Commercial Airport was on the 1964 Mobile Sectional Chart. 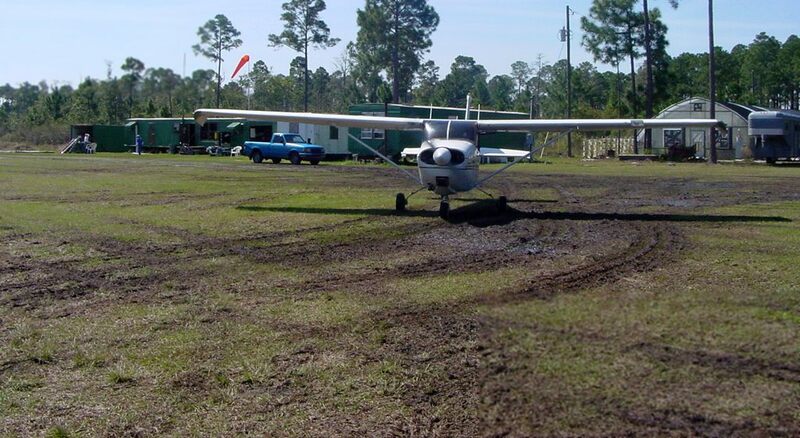 It depicted Tallahassee Commercial as having a 2,600' unpaved runway. with 4 T-hangars & 5 single-engine aircraft along the west side of the field. as having 2 unpaved 2,600' runways, and a few small buildings on the west & east sides. 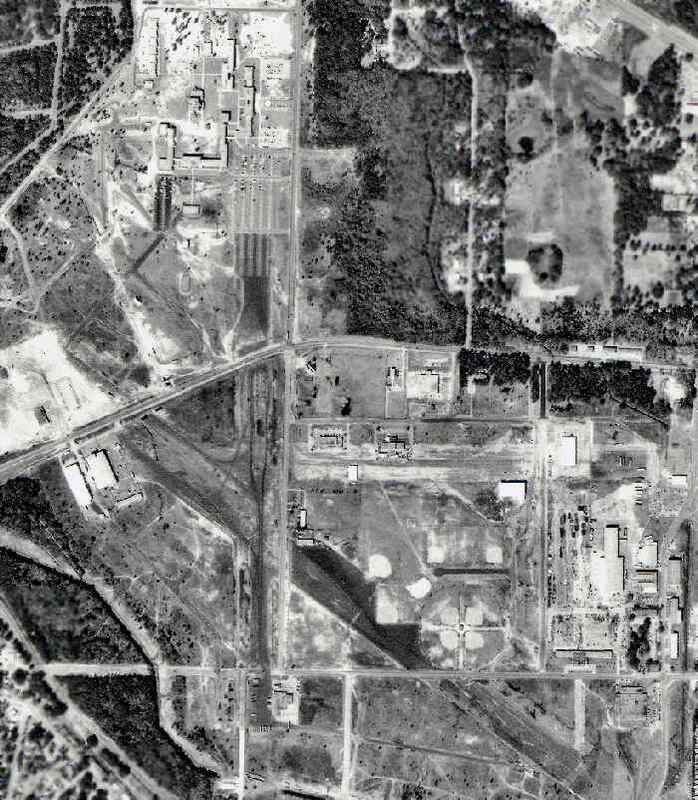 The earliest photo which is available of Tallahassee Commercial Airport was a 5/8/70 FL DOT aerial view (courtesy of David Henderson). and several small hangars & 5 single-engine aircraft on the west side. Bill Walker recalled, “I have flown out of Tallahassee Commercial Airport before it closed. That place was populated by some real cowboys. One guy I saw, with about 100 hours, claimed he could take off in a 172, clear a 50' obstruction, and land, on that little runway. 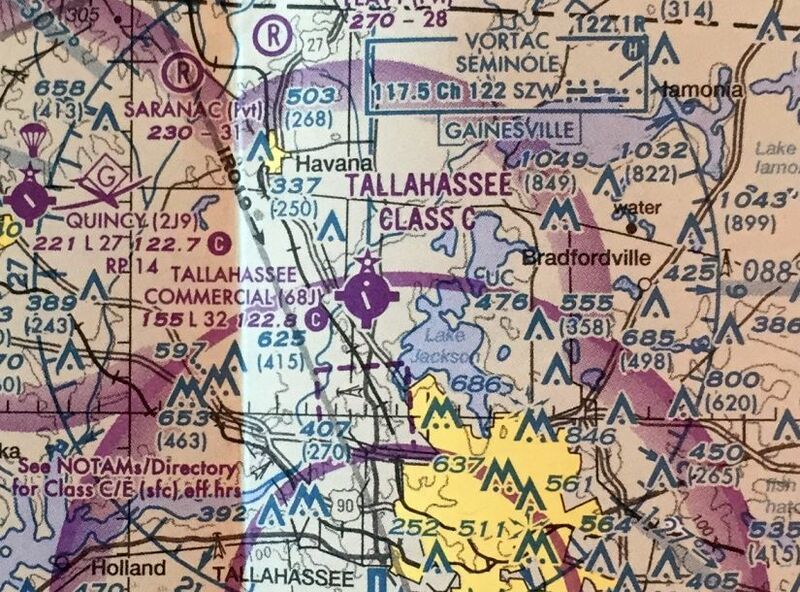 The 1983 USGS topo map showed that Tallahassee Commercial's Runway 16/34 was paved at some point between 1967-83.
with a several small hangars & 2 single-engine aircraft on the west side. A 4/7/07 photo looking north at Tallahassee Commercial's runway & buildings. A 2009 photo showed the Tallahassee Commercial Airport office, with a Cessna in the background. 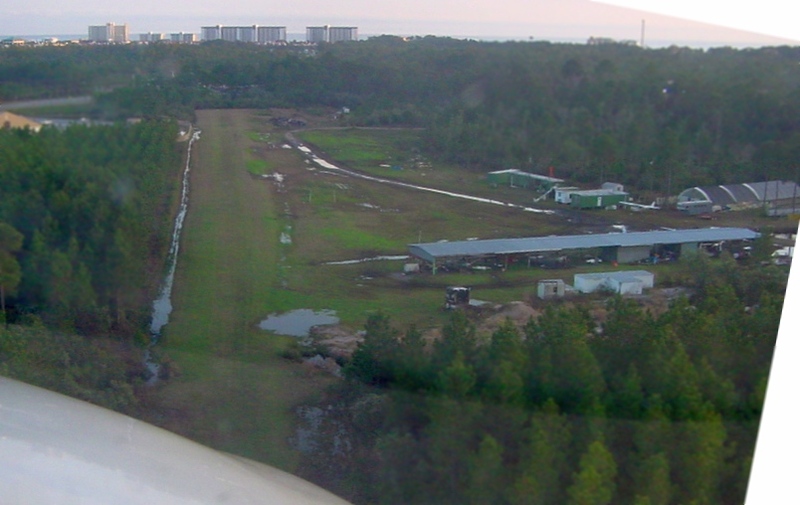 The last photo which has been located showing Tallahassee Commercial Airport while still open was a 1/30/09 aerial view looking southeast. 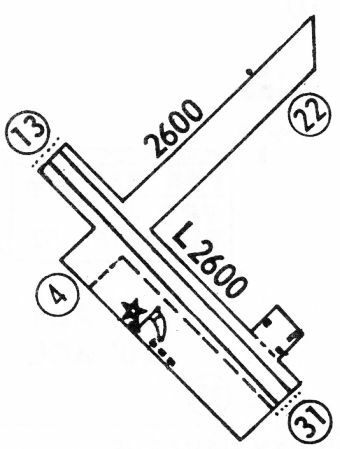 It showed that the threshholds had been displaced on both ends, decreasing the runway length. Two single-engine aircraft were still visible on the west side. Most of the T-hangars along the west side of the field had been removed at some point between 1992-2009. 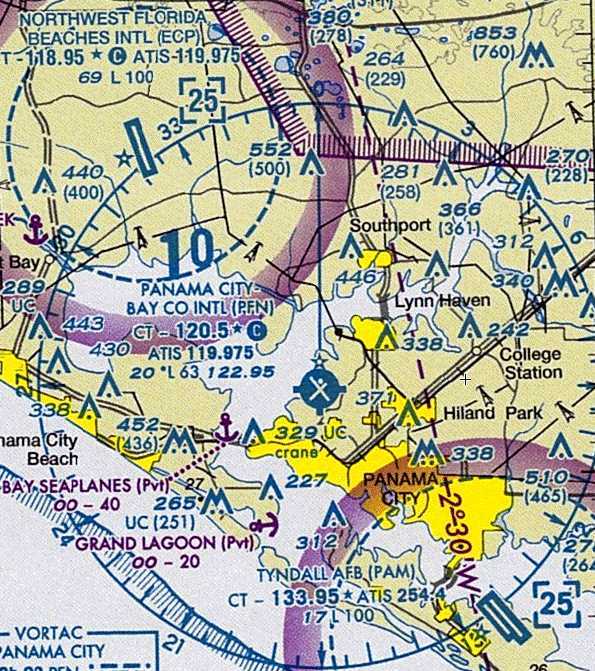 The last aeronautical chart depiction has been located of Tallahassee Commercial Airport was on the 2009 Jacksonville Sectional Chart. 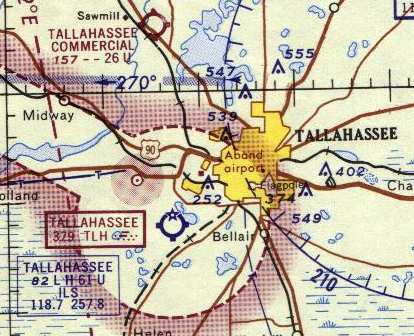 It depicted Tallahassee Commercial as having a 3,200' paved northwest/southeast runway. 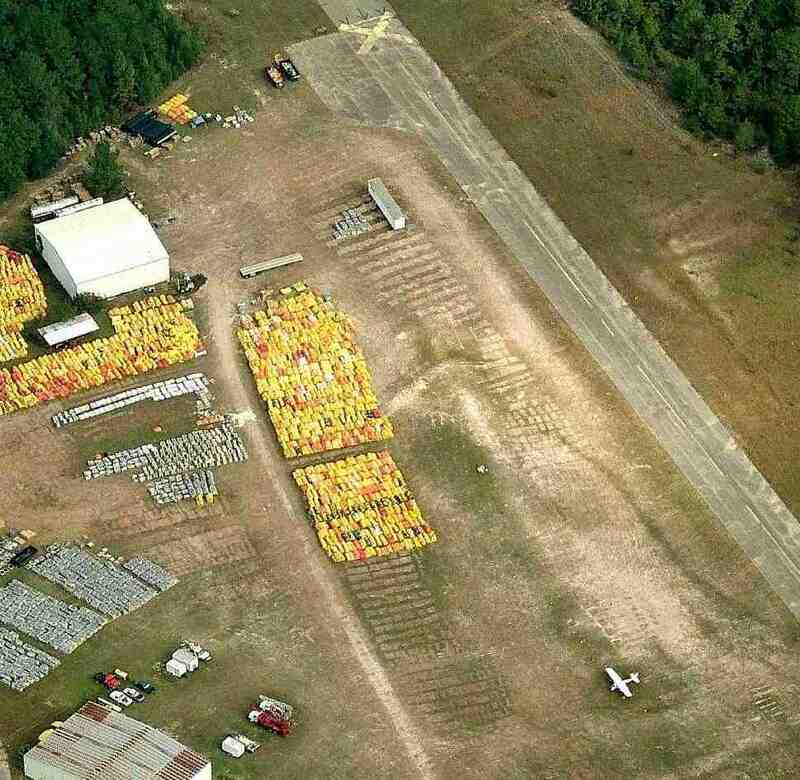 and showed large numbers of yellow objects stored to the west of the runway. Jamie Peate reported of the yellow objects stored on runway, “We drove by frequently. The items were oil & debris containment booms, etc. that were used during the BP Deepwater Horizon oil spill. They used the field at the end/side of the airport as a storage area for several months during the cleanup effort. but a solitary Cessna was evidently “stranded” on the field (presumably not airworthy). Large numbers of oil containment booms were stored to the west of the runway. 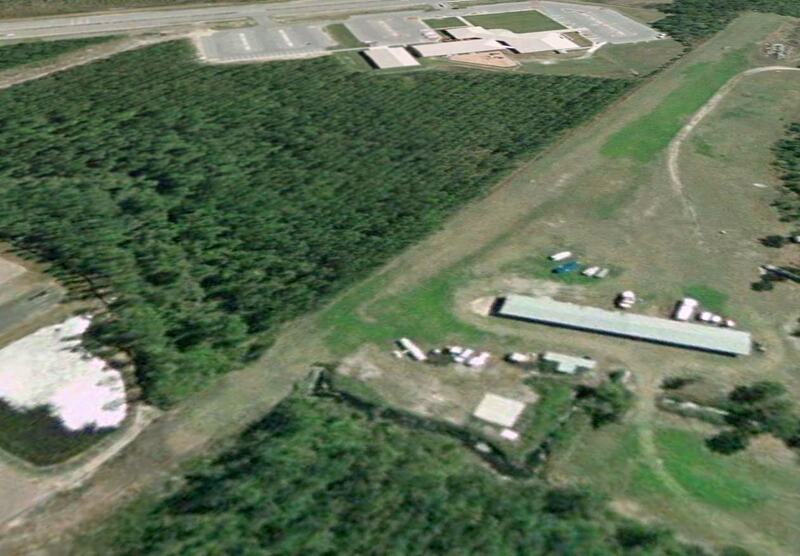 The last photo which has been located showing Tallahassee Commercial Airport was a 1/14/12 aerial view looking southeast. The oil containment booms previously being stored on the field in 2010 had been removed, and the airport remained otherwise intact. “in poor condition”, with “surface cracking”. The field was said to have 10 based aircraft, and as of 2010 was said to conduct an average of 50 takeoffs or landings per week. The owner was listed as J.W. Hinson Jr., and the manager listed as Jonnie Stephens. However the airport use was listed as “Closed Indefinitely”. A 10/26/17 aerial view by Alex Melia looking north at Tallahassee Commercial Airport. Alex reported, “We landed a few miles away at Quincy & asked the old timers. 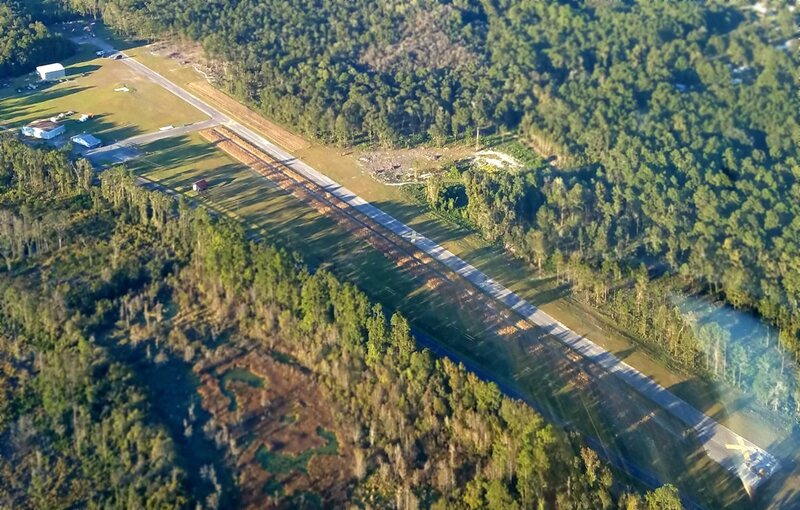 A 3/10/18 photo by Matt Franklin looking northwest along the former Tallahassee Commercial Airport runway. A 3/10/18 photo by Matt Franklin of the former Tallahassee Commercial Airport hangar, still marked with “Piper” lettering. A 3/10/18 photo by Matt Franklin of the former Tallahassee Commercial Airport office. 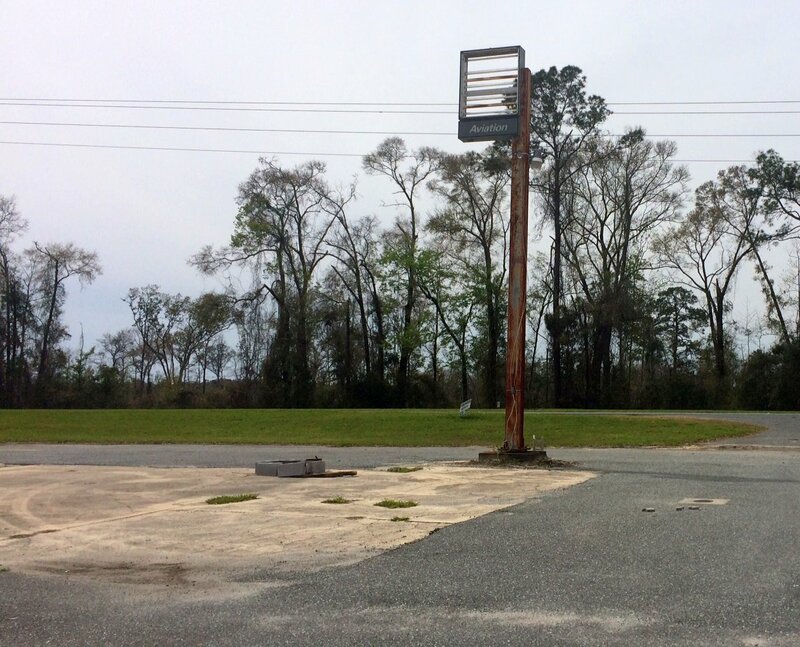 A 3/10/18 photo by Matt Franklin of the former Tallahassee Commercial Airport sign. 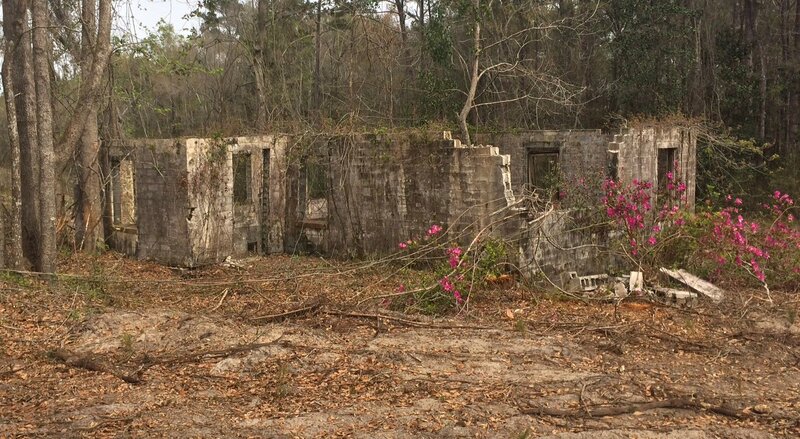 A 3/10/18 photo by Matt Franklin of the ruins of an unknown building at the former Tallahassee Commercial Airport. 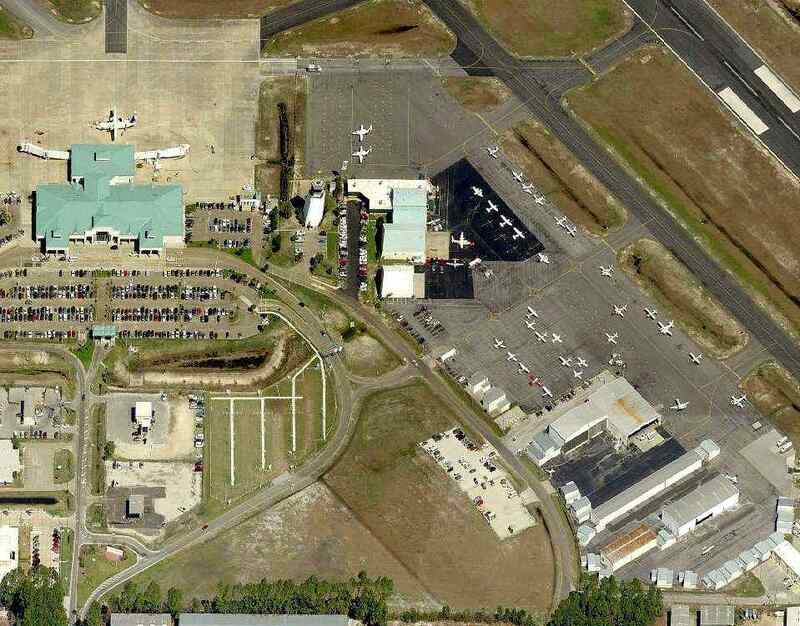 Tallahassee Commercial Airport is located north of the intersection of North Monroe Street & Box Wood Lane. 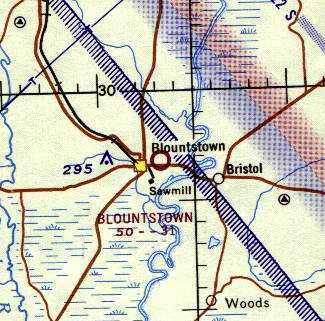 Blountstown Airport, as depicted on the 1964 Mobile Sectional Chart. as it was not yet depicted on a 1957 aerial photo (courtesy of Dallam Oliver-Lee). The earliest depiction which has been located of Blountstown Airport was on the 1964 Mobile Sectional Chart. 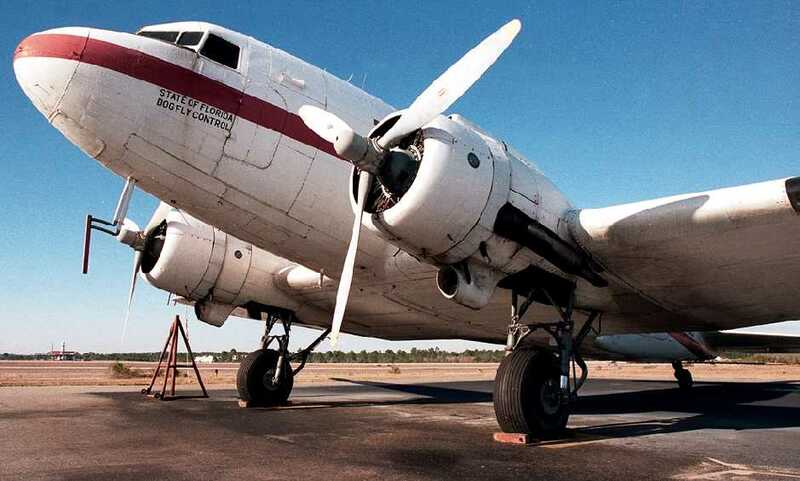 It depicted Blountstown as having a 3,100' unpaved runway. Bill Walker recalled, “In 1963 my family moved to Tallahassee. With extended family in Panama City, we traveled Highway 20 regularly. As soon as you come off the bridge spanning the Apalachicola River (westbound), on the right was the strip, and on the left was the Airport Hotel. I always thought the name of the hotel was a tad overambitious, since the strip was nowhere near being a proper airfield. I very distinctly remember the strip being at right angles to the highway. And I don't believe this smaller strip being anywhere 3,000'. It couldn't be over 1,000'. One reason I remember is the hotel was directly under northbound approach (roughly 360). 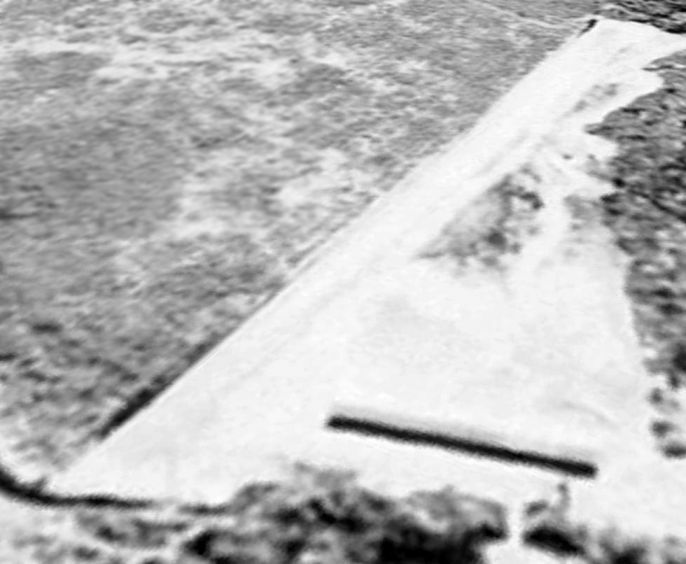 The earliest photo which has been located of Blountstown Airport was on a February 1964 aerial view (courtesy of Dallam Oliver-Lee). 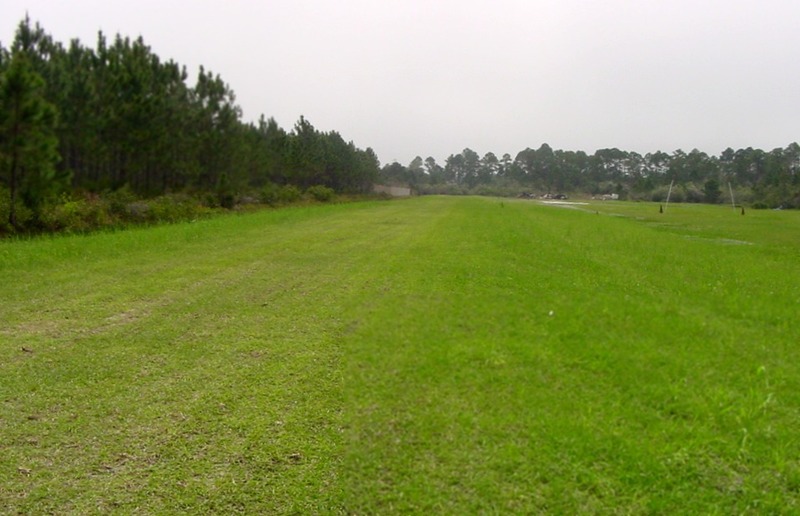 It depicted Blountstown as having a single unpaved northwest/southeast runway. No hangars or aircraft were visible on the field. 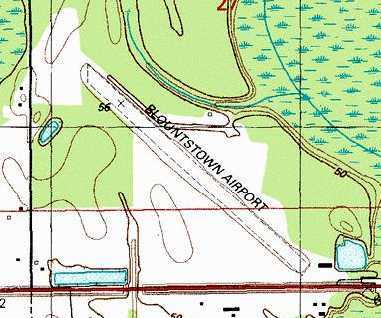 Blountstown Airport still was not depicted on the 1979 USGS topo map (according to Dallam Oliver-Lee). as having a single unpaved northwest/southeast runway, with a single building (hangar?) on the southeast side. 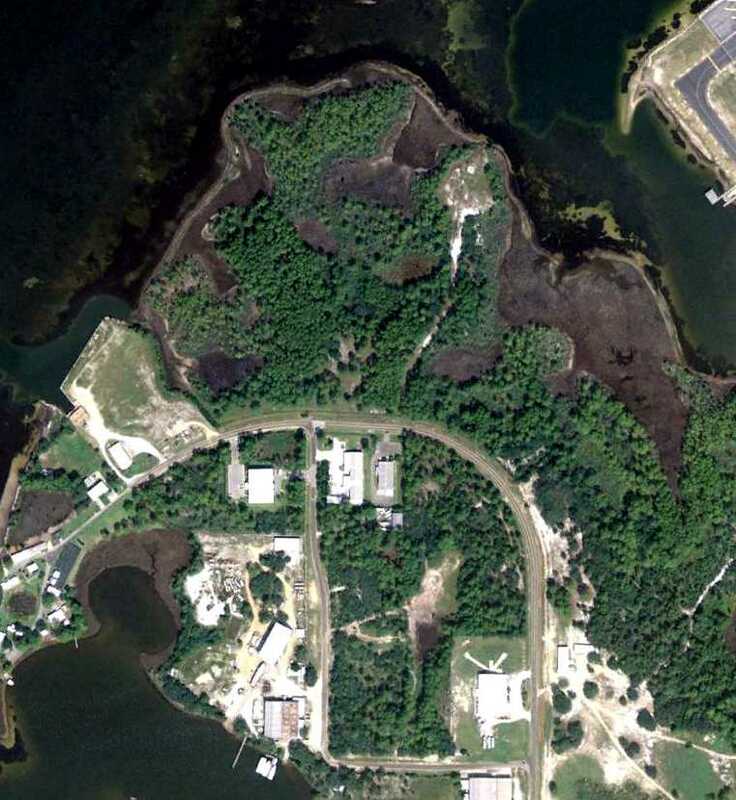 A 2/14/94 USGS aerial view looking northwest along Blountstown's runway showed the building at the southeast corner. as only its foundation was visible on a 1998 aerial photo & later photos. 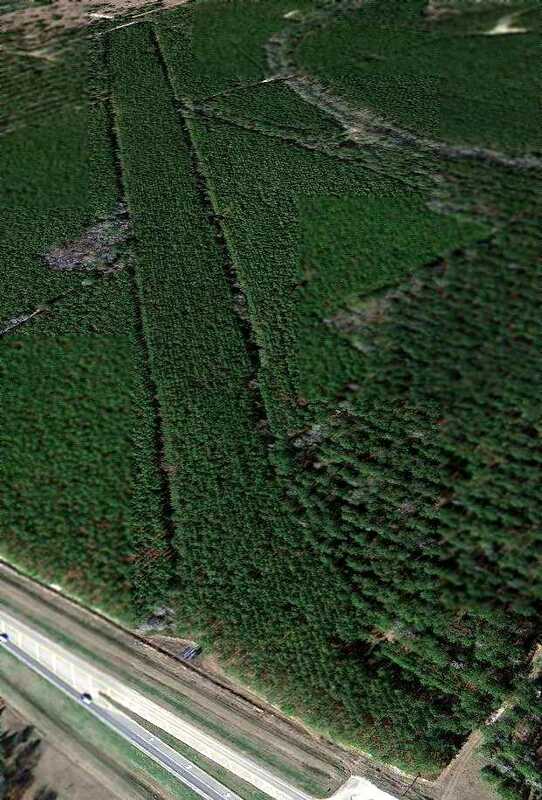 even though the surface was covered with pine trees planted after the airport's closure. The foundation of the building at the southeast corner was also still barely recognizable. Aidan Brainard reported in 2013, “Across Highway 20 from this former airport, there is a small hotel called the 'Airport Hotel'." 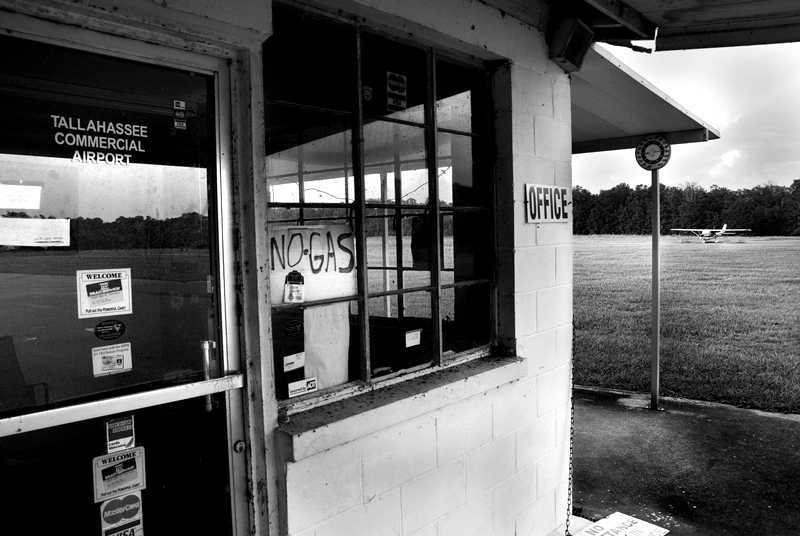 Kevin Fleming reported in 2015, “I drive by the old Blountstown airstrip often. The overgrowth mentioned [in the caption of the 2012 photo] was actually planted pines. 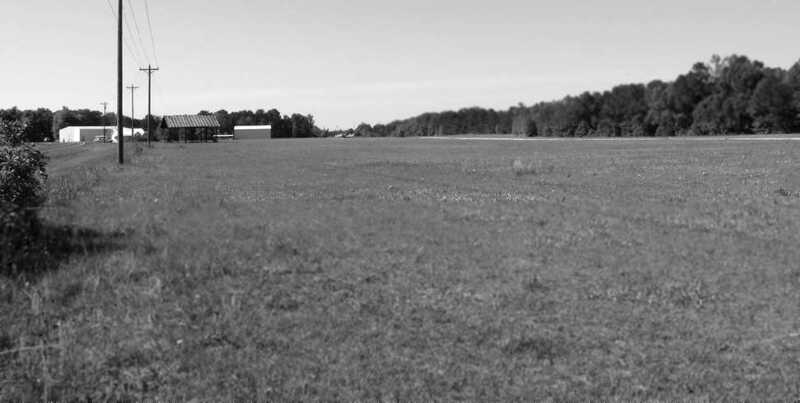 The site of Blountstown Airport is located northeast of the intersection of Route 20 & Mason Road. 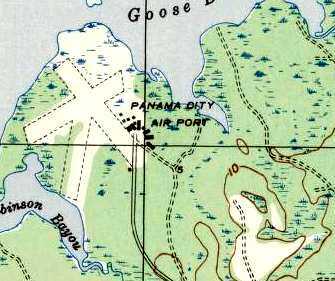 The original Panama City Airport, as depicted on the July 1940 Mobile Sectional Chart. The date of establishment of Panama City's original airport has not been determined. Atkinson Field reportedly began as a private field owned by Panama City citizen J.B. Atkinson, Jr. The facility consisted of 292 acres with grass runways. 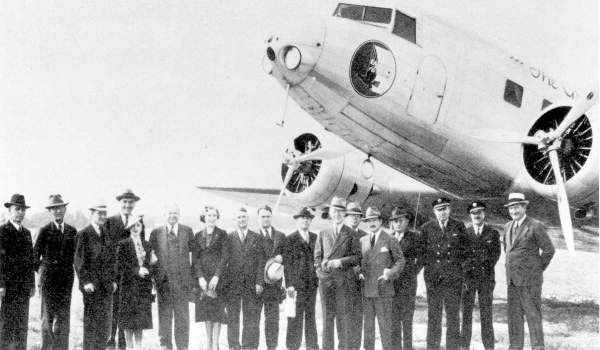 In 1932, Atkinson donated the property to the Panama City Chamber of Commerce so that a city airport could be established. At that time the airport was named Atkinson Field. “Possibly nothing of the year is quite equal to the magnanimous gift to the city of the site for ;the municipal airport. This gift was made Wednesday afternoon by Mr. & Mrs. J. B. Atkinson. with North Bay as a landing for seaplanes in the finest harbor in the South. The seaplanes may land in North Bay & taxi into the bayou in the roughest weather. The article continued, “It is understood the the streets leading to the port will be hard surfaced immediately. And that within 10 days actual work will begin & rushed to completion. This has been one of Panama City's greatest needs. And the public spirited generosity of Mr. & Mrs. Atkinson is greatly appreciated. It is most appropriate that the field should be named Atkinson Municipal Airport. as a municipal field located 5 miles northwest of the center of the city. It was said to be an irregular sod field containing two 1,800' runways, oriented northwest/southeast & northeast/southwest. A hangar on the north side was said to have “Panama City” on the roof. 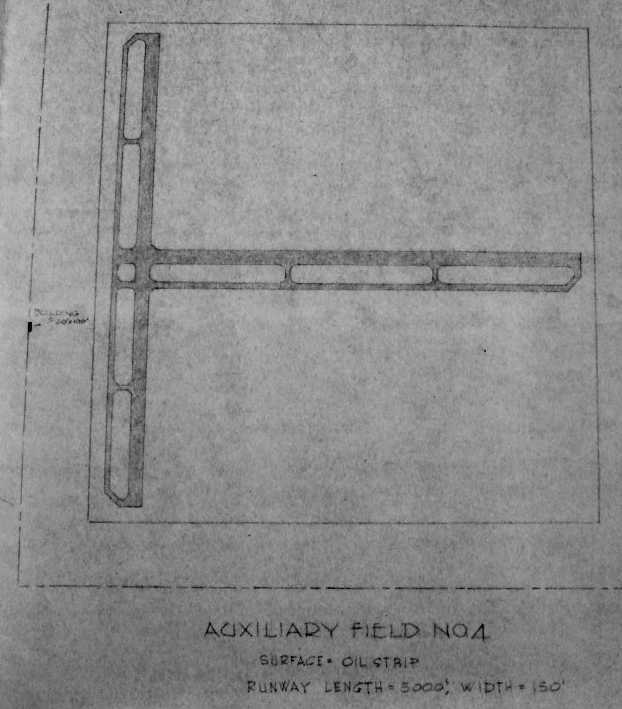 The earliest depiction which has been located of Atkinson Field was on the July 1940 Mobile Sectional Chart. It depicted “Panama City” as an auxiliary airfield. 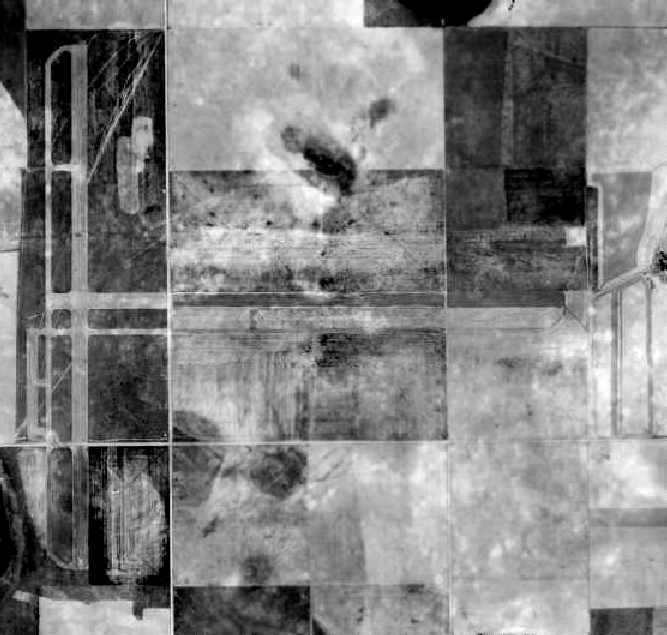 The earliest photo which has been located of Atkinson Field was a 11/3/42 USGS aerial view (courtesy of Brian Rehwinkel). Note that there was not yet any sign of the “new” airport which would eventually be constructed adjacent to the east side of the original airfield. Throughout World War II, the airport was used as a Civil Air Patrol facility. as a 360 acre irregularly-shaped property having 3 sand & sod runways, the longest being the 1,900' north/south & northwest/southeast strips. to be owned by Bay County & the City of Panama City, and to be operated by private interests. The last aeronautical chart depiction which has been located of Atkinson Field was on the August 1946 Mobile Sectional Chart. It depicted “Panama City” as a commercial/municipal airport. Robert Wilson recalled, “The original Panama City airport was located at the north end of Frankford Avenue. 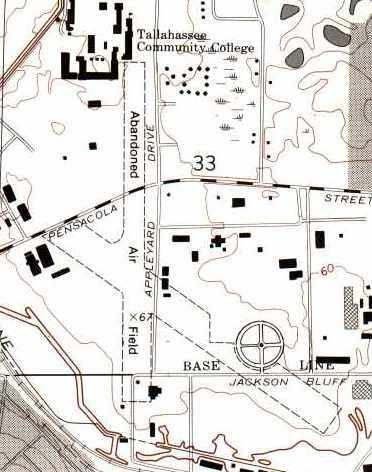 The last depiction which has been located of Atkinson Field was on a 1947 Army Map Service map (courtesy of the University of Alabama online Map Library). It depicted “Panama City Air Port” as having 3 unpaved runways. as depicted on the February 1949 Mobile Sectional Chart. did not offer room for longer runways. The 1957 USGS topo map no longer depicted Atkinson Field, just a clearing. 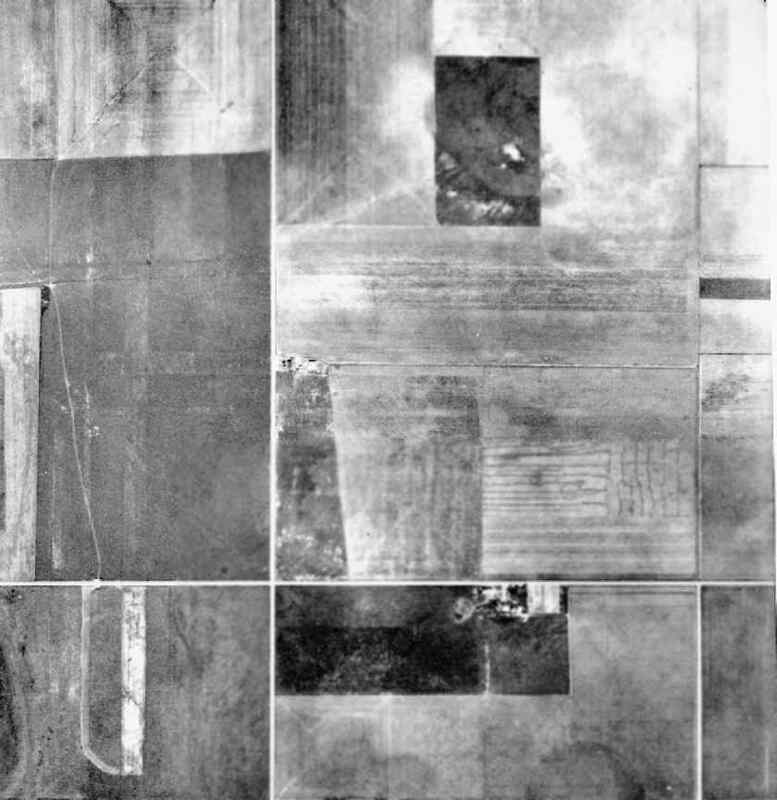 was a 1/8/64 USDA aerial photo (courtesy of Brian Rehwinkel). The 3 grass runways of the original field were still perceptible. and no trace was recognizable of the former runways. when the “Heli-Tech Inc Heliport” (99FD) was established on the southeast corner of the former Atkinson Field property. A circa 2006-2010 aerial view looking south at the Heli-Tech Inc Heliport which sits at the southeast corner of the Atkinson Field site. The heliport was still operational as of 2010, engaged in the business of overhauling light civilian helicopters. although the Heli-Tech Inc Heliport is located on the southeast corner of the site. 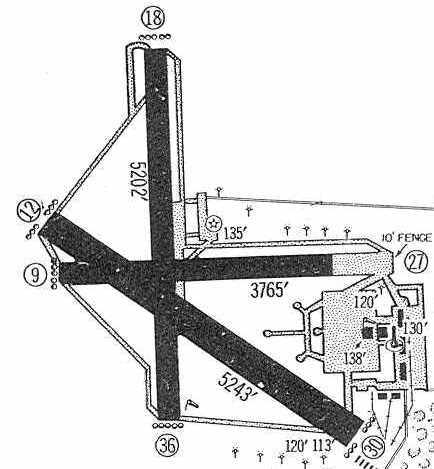 Panama City Bay County Airport, as depicted on the February 1948 Mobile Sectional Chart. 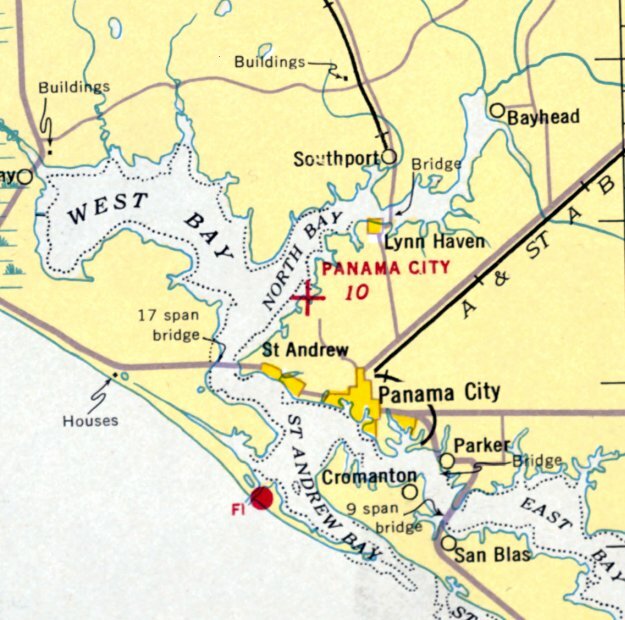 Panama City's original airport, Atkinson Field, was geographically constrained on a narrow spit of land. 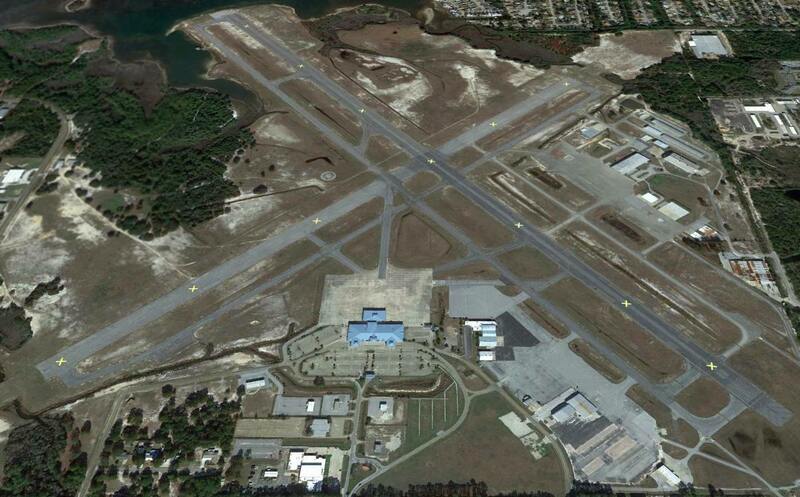 Panama City & the Bay County Commissioners joined forces to develop a more-capable airport. located adjacent to the east side of the original Atkinson Field. After construction was completed, the new airport was named Fannin Field in honor of the Panama City mayor during this period. 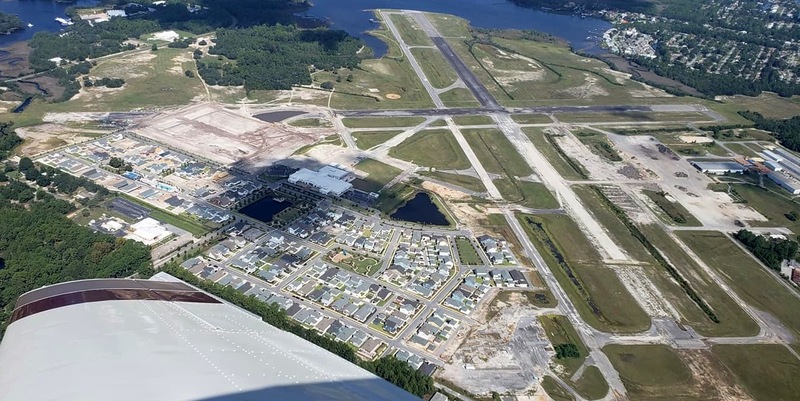 the Panama City-Bay County Airport & Industrial District, to manage Fannin Field. Fannin Field was not yet depicted on the 1943 USGS topo map. Fannin Field was established in 1945, according to a historical marker at the site. Fannin Field was not yet depicted on the February 1947 Mobile Sectional Chart. Commercial operations at Fannin Field commenced in 1948. 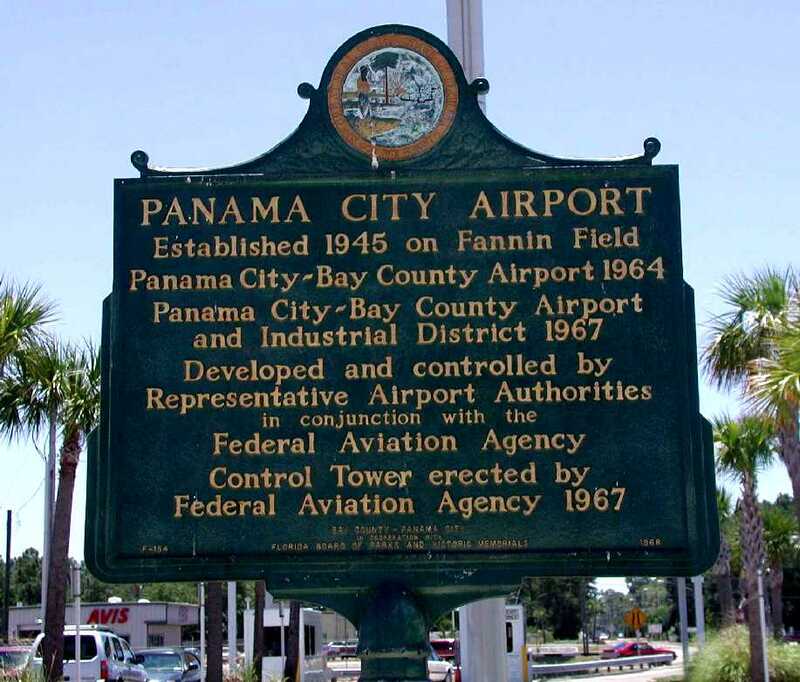 At some point between 1945-48 the airport was renamed Panama City Bay County Airport. 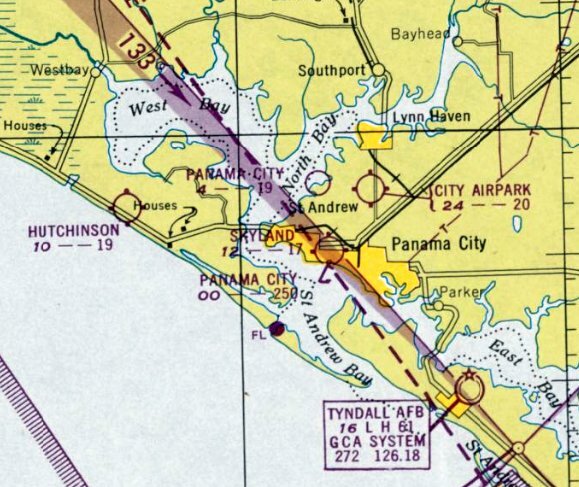 The earliest depiction which has been located of Panama City Bay County Airport was on the February 1948 Mobile Sectional Chart. It depicted Bay County Airport as having a 4,000' paved runway. “that shows the new airfield, along with the abandoned (old) airfield to the northwest. 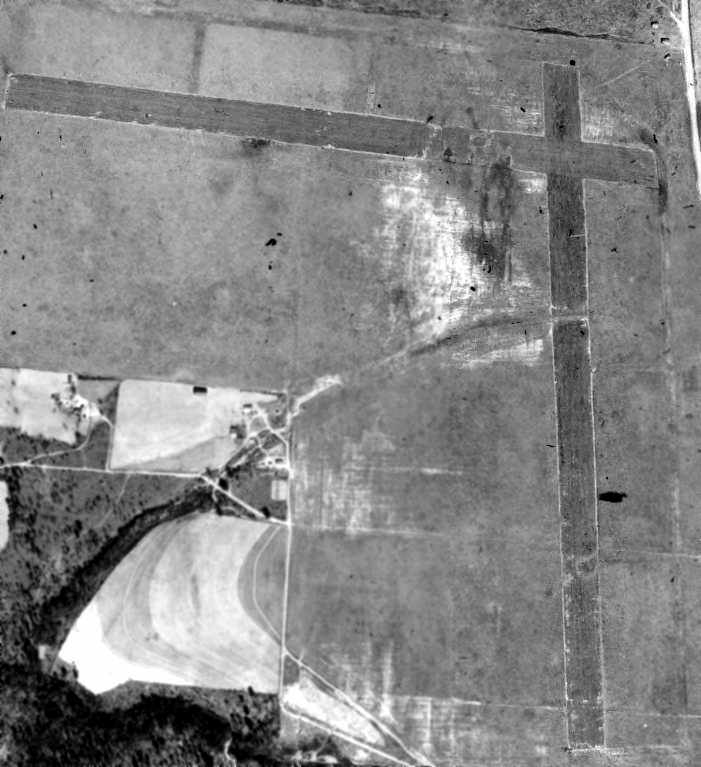 This 1953 photo shows the 'new' field with only one runway - a paved runway situated southwest/northeast. 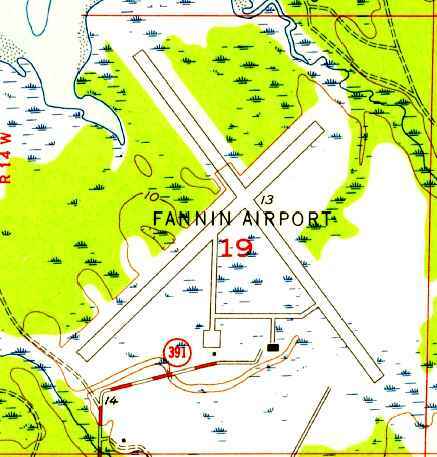 The 1956 USGS topo map depicted Fannin Airport as having 2 perpendicular paved runways & taxiways leading to a ramp & 2 small buildings on the south side. 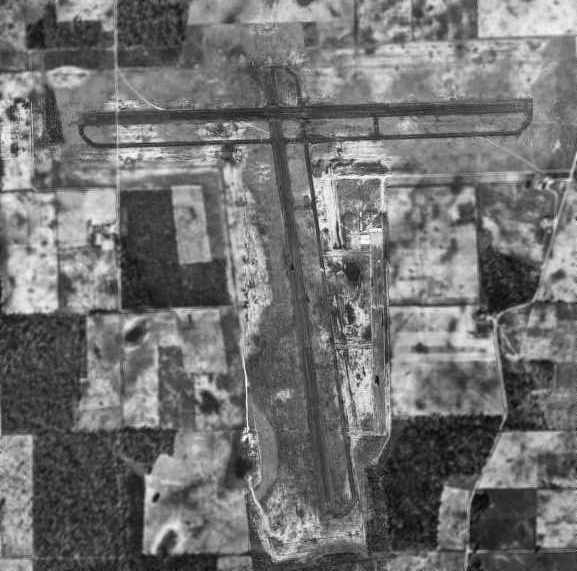 A 1956 aerial view of Bay County Airport (courtesy of Brent Mooney), showing where the terminal soon would be constructed. 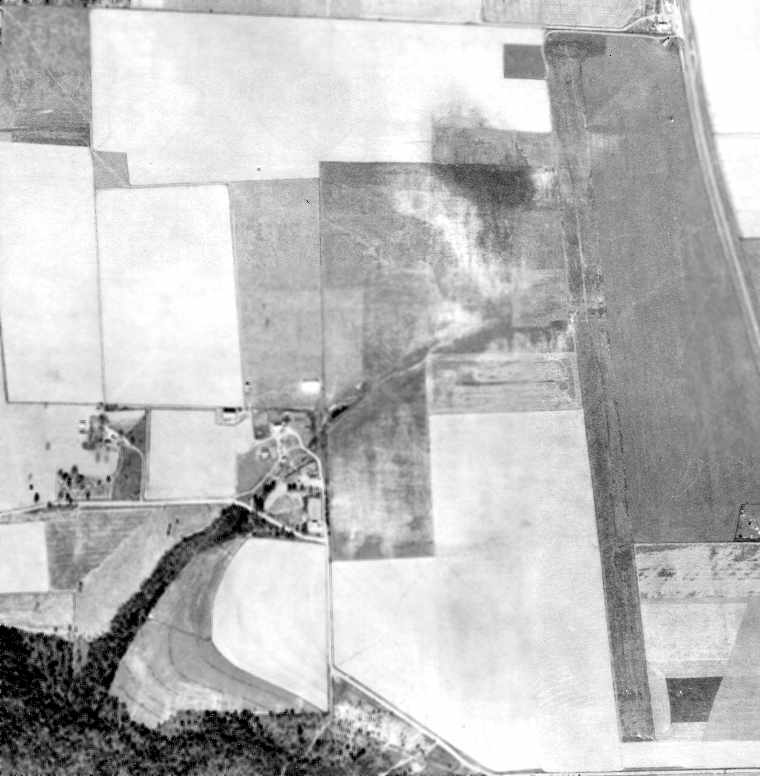 as depicted on a 1/8/64 USDA aerial photo (courtesy of Brian Rehwinkel). According to a historical marker at the site, Panama City's control tower was erected by FAA in 1967. The earliest photo which has been located of an aircraft at Fannin Field was a 1969 photo (courtesy of Brent Mooney) of a National Airlines Convair 440.
what appears to be some type of small submarine, and a Ryan Firebee drone. until the passage of the Airline Deregulation Act of 1978. During the 1970s & 1980s, the airport had many airlines serving the facility with jet aircraft. and, in turn, passenger enplanements were relatively low. with parallel taxiways & a ramp on the south side. A January 1988 photo by Javier Bobadilla at Panama City Airport of a 1945 Douglas VC-47D Skytrain (N843DD, cn 32286) used by the State of Florida to spray pesticides. A February 1988 aerial view by Javier Bobadilla on final approach to Panama City's Runway 32. A May 1988 photo by Javier Bobadilla of a Ft. Rucker AH-1S Cobra refueling at Panama City's Bay Aviation. 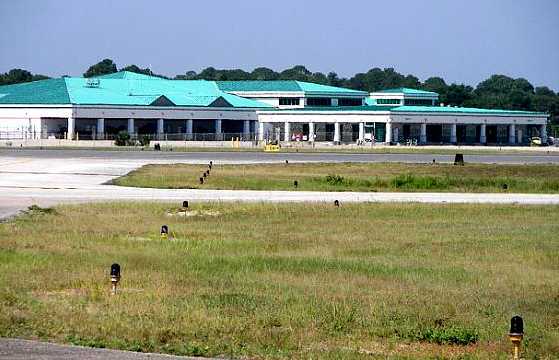 In 1992, the airport was designated as an international airport & renamed Panama City-Bay County International Airport. At this time, the airport was equipped with on-call customs & immigrations facilities provided through the Port of Panama City. In addition, the airport was also declared a Foreign Trade Zone, a location which allows special customs procedures to be used. These procedures permit domestic activity involving foreign items to take place as though they were outside of a U.S. Customs territory. and ramps on the south & east sides with several hangars. demolishing their old terminal building & constructing a new 55,573-square-foot facility with 6 gate areas, 2 equipped with jetbridges. airport administration offices, public and rental car parking lots, and an expanded terminal apron. but later sold out to Sheltair just a few years ago. Bay Aviation was purchased by Sowell Aviation around the 2000 time frame, but only operated it as an FBO for a short time. A 10/25/03 photo by Paul Robbins of the exterior of the new Panama City terminal building. It served for only 15 years before the airport was closed. A 2006 photo of a historical marker. A circa 2006-2010 aerial view looking north at the busy ramp of Panama City Bay County International Airport. with 6 UH-1 Huey fuselages on the west side. 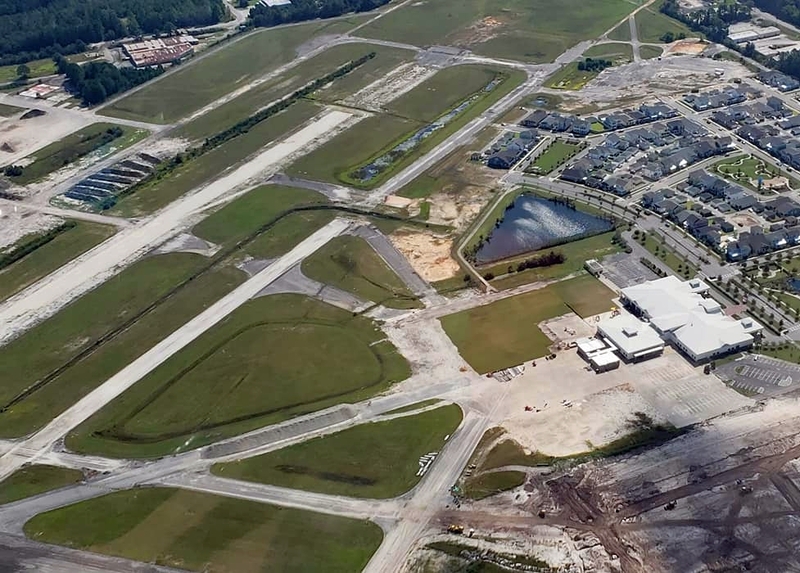 in 2007 construction started on a new airport to the northwest (Northwest Florida Beaches International Airport) to replace the original field. I rented planes from Precision Avjet & also kept my 1972 Grumman AA5 Traveler there after I bought it in 2007. Precision Avjet was owned by Jeff Kish & his wife Ellen Rodeman Kish. Jeff was an absentee owner, being a pilot with Delta Air Lines in Atlanta. Although living in Atlanta, Jeff made frequent visits to Precision Avjet. We pilots & the Precision Avjet staff, particularly the front counter girls, always joked & clowned around about something. Rainy days were 'hang out' days & no matter the weather, we all had a good time inside the front counter area. Sometimes, the staff dressed up in costume, say for Halloween. It was a wonderful time in the airport's history. A 2007 aerial view of looking north at Panama City Bay County International Airport, showing many aircraft on its numerous ramps. on the east ramp & adjacent to a hangar on the east side of Panama City Bay County International Airport. Harvey Weir reported in 2010, “The helicopters... a large number parked tail to tail. Those were being completely overhauled, zero-timed, and fitted with 2 Allison turbines instead of the single engine. The name of the company... might have been DynCorp. They were going to a foreign army, possibly down to Panama. and all airline service was discontinued as well as all the instrument approaches including GPS approaches. with airline flights moving to the new airport. and all based GA aircraft had to remain at PFN because there were no GA facilities available at the new airport. A May-September 2010 photo by Harvey Weir of the exterior of the old 'Bay Hangar'. A May-September 2010 photo by Harvey Weir of the Panama City terminal building. which was said to conduct an average of 251 takeoffs or landings per day. 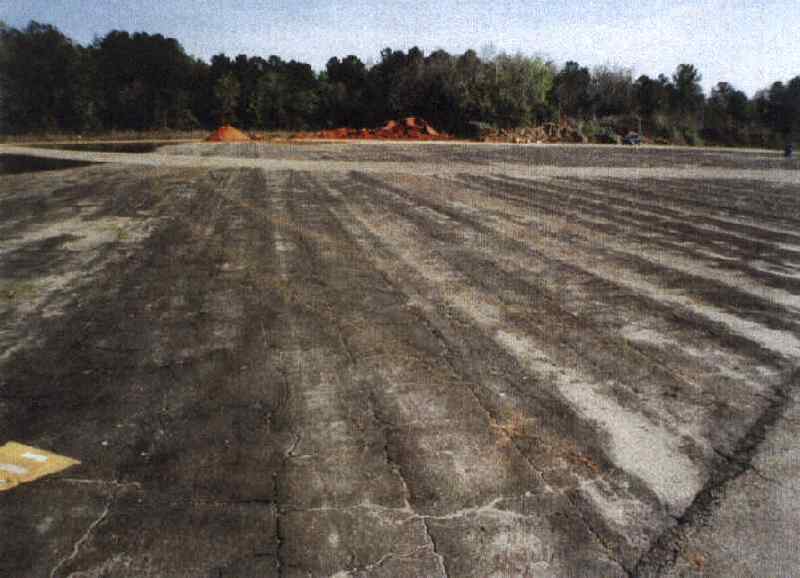 The field was described as having 2 asphalt runways: 6,308' Runway 14/32 & 4,884' Runway 5/23. Harvey Weir reported, “GA was finally ordered to move off PFN by midnight 9/30/10 & the airport closed forever. Bill Fusselman recalled, “We were all so sad when the airport closed! as having 2 paved runways, the longest being 6,300'. The replacement airport was depicted to the northwest. A 12/20/10 view over a sunset over the abandoned Panama City Bay County International Airport terminal & control tower. 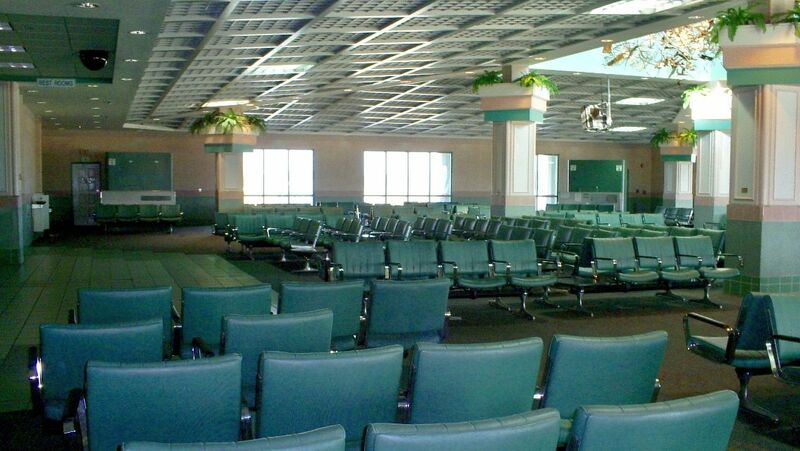 A 2011 photo of the interior of the abandoned Panama City Bay County International Airport terminal building (courtesy of Brent Mooney). A 2012 aerial view of looking north at Panama City Bay County International Airport. A 9/3/16 photo by Matt Franklin of the curbside of the Panama City terminal building. Matt reported, “The terminal building has been turned into a school, and they left the back gate open to drive right onto the airport. A 9/3/16 photo by Matt Franklin of a former Panama City hangar. Matt reported, “One of the FBO hangars has been repurposed for holding massive wire spools. and a housing development is encroaching on the airport from the south side, which I am sure will envelope the remainder of the airport. A 1/25/18 aerial view by Alex Price looking southeast at Panama City Bay County International Airport. showing the large swath of land which has been cleared over the southwest runway end and west of the former terminal building. A 9/30/18 aerial view by Alex Melia looking southeast at Panama City Bay County International Airport. 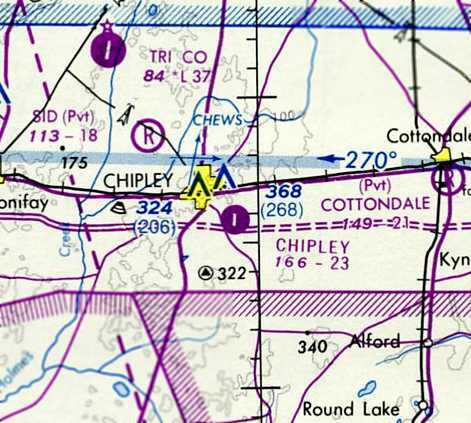 Chipley Municipal Airport, as depicted on the February 1945 Memphis Sectional Chart (courtesy of Chris Kennedy). was on the February 1945 Memphis Sectional Chart (courtesy of Chris Kennedy). It depicted Chipley as an auxiliary airfield on the southeast side of the town. 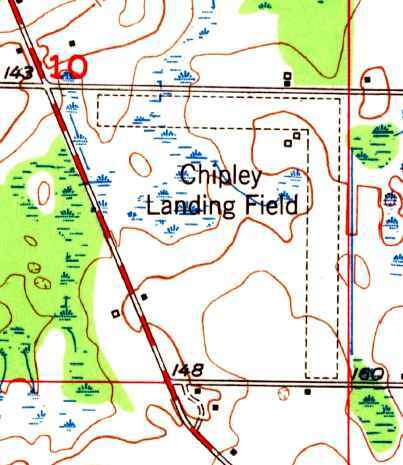 The 1950 USGS topo map depicted the Chipley Landing Field as having 2 unpaved runways, with 2 small buildings just southwest of the runway intersection. 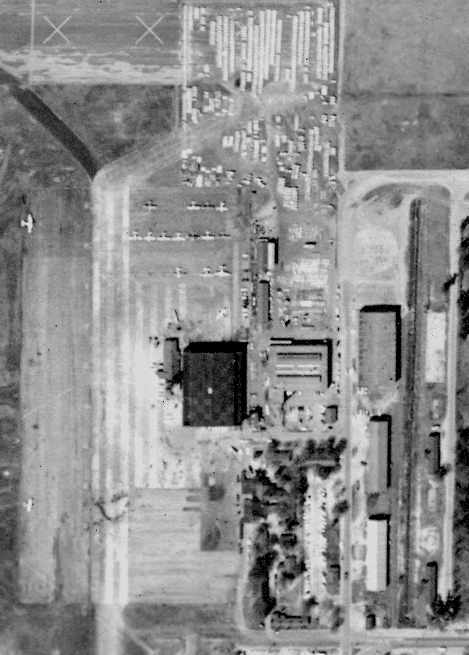 The only photo which has been located showing the Chipley Airport while it was operational was a 1955 aerial view. 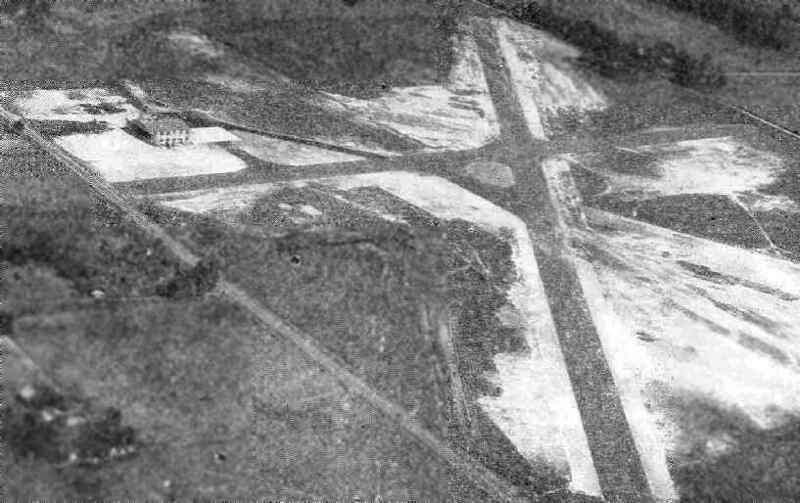 It depicted Chipley as having 2 perpendicular grass runways, with a circular airport marking visible at the runway intersection. 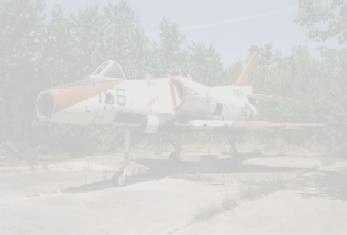 There did not appear to be an hangars or other buildings at the airport, and there were no planes visible either. The 1964 Mobile Sectional Chart (courtesy of John Voss) depicted Chipley as having a 2,400' unpaved runway. 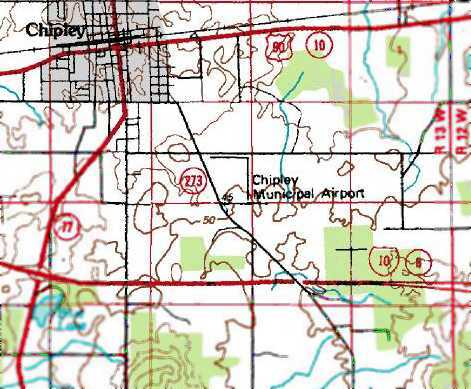 The 1976 USGS topo map depicted Chipley Municipal Airport as having 2 perpendicular runways. was on the December 1976 New Orleans Sectional Chart (according to Chris Kennedy). 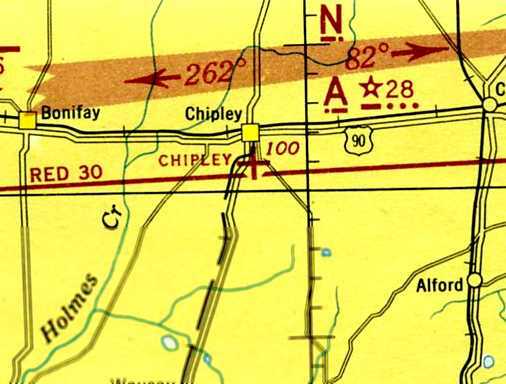 It depicted Chipley as having a single north/south paved 2,300' runway. The field had evidently been paved at some point between 1964-76. Lindy Kirkland recalled of the Chipley Airport, “I flew from it several times with a friend in the summer of 1981. It was a very small runway, probably only 3,000', paved, with just some tie-downs in the grass around it was all that was there. It closed between 1981 when I last flew from there, and around 1984 when the West Point plant & the industrial park was built. and several industrial buildings had been built around the former airport site. 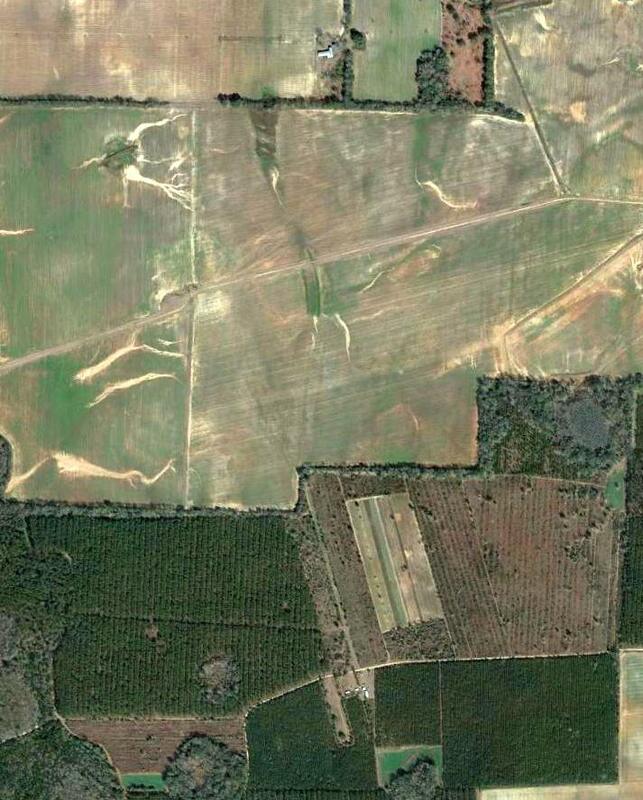 A 12/30/04 aerial view showed the remains of the 2 Chipley runways still were recognizable. 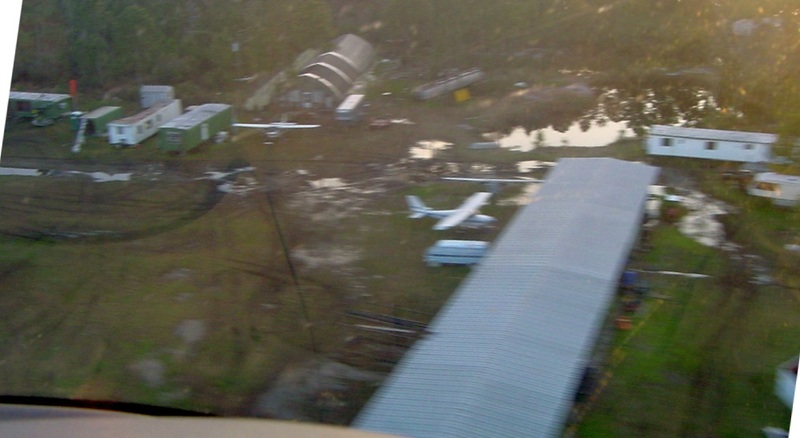 A circa 2006 aerial view looking north along the remains of Chipley Airport's north/south paved runway. Lindy Kirkland reported in 2009, “The area is now an industrial park with the primary tenant being West Point Stevens. The site of Chipley Airport is located southeast of the intersection of Orange Hill Road & Airport Road, appropriately enough. 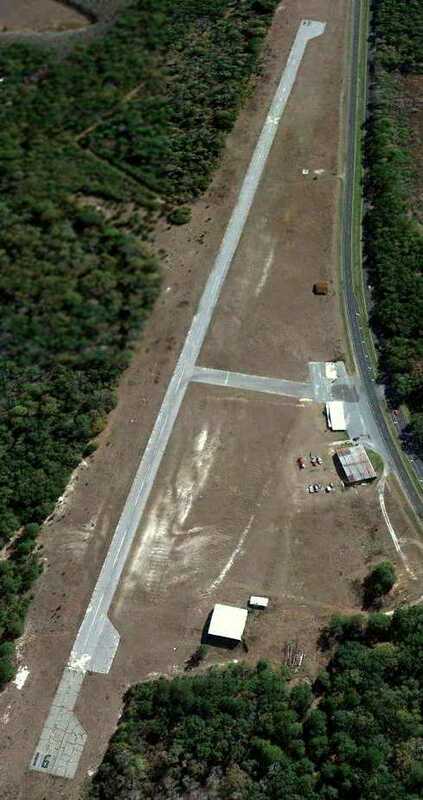 Thanks to Lindy Kirkland for pointing out this airfield. a training field for the 50,000 Pilot Training Program. described the Faceville auxiliary field property as having been acquired in 1942 & attached to Bainbridge AAF. and 17 acres of leased property. a 3,800' north/south runway & a 3,600' east/west strip. The field also had one building, described as being of "temporary construction, one story". The total cost of the field - including acquisition cost & betterments - was $92,113. 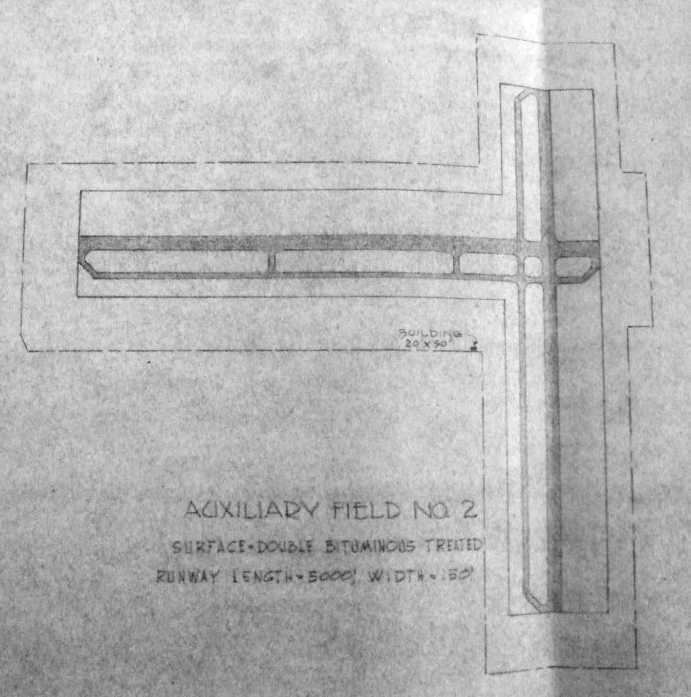 It depicted “Bainbridge AAF Auxiliary #3 (Faceville Field)” as having 2 asphalt runways, each with a parallel taxiway. and the remarks said "Auxiliary to Bainbridge Field." (with the northern end of the runway just a few feet south of the state line). as a 311 acre L-shaped property within which were 2 asphalt 3,000' runways, oriented north/south & east/west. 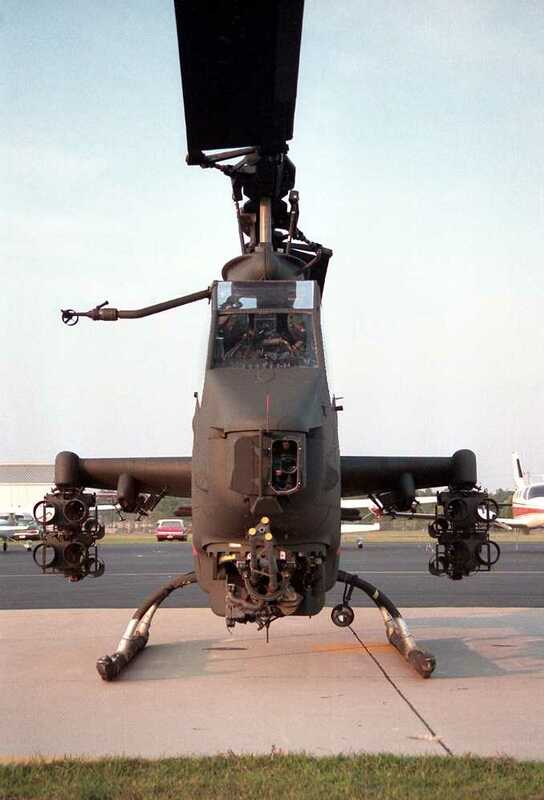 to be owned by private interests, and operated by the Army Air Forces. 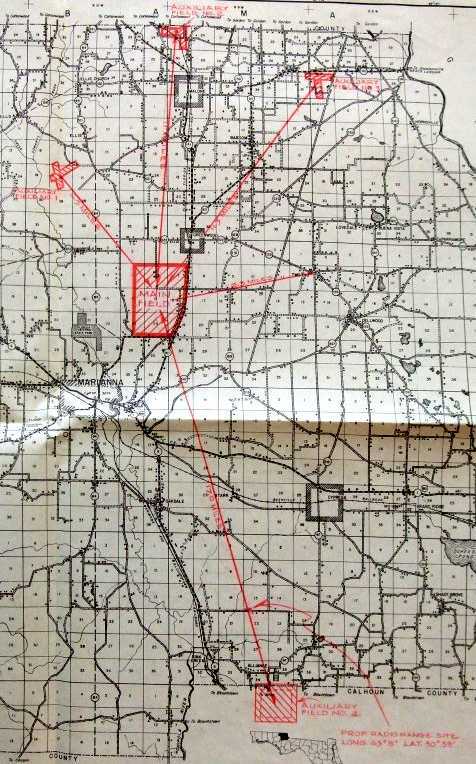 Faceville Aux #3 was still depicted as a military airfield on the 1945 Mobile Sectional Chart (courtesy of John Voss). recommended the land be disposed of & returned to its "highest & best use" as "Farm Land". In this photo it appeared as if the airfield had already been abandoned. as well as the much more faint trace of parallel taxiways along both runways. There was no trace of any buildings or other facilities. as it was not depicted at all on the 1949 Mobile Sectional Chart (courtesy of John Voss). but most of the north/south runway remained intact. 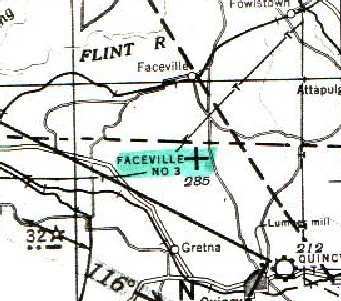 The Faceville airfield was not depicted at all on the 1957 USGS topo map. Brian Rehwinkel reported in 2003, "I have visited this site recently & it is (and has been) used for agricultural purposes. There is nothing left of the runways." 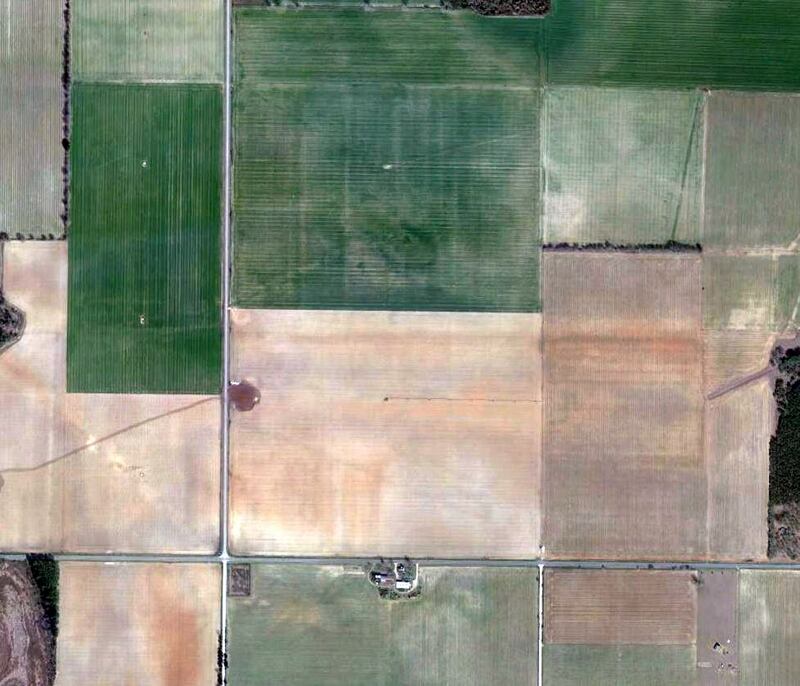 A 4/1/13 aerial photo showed no trace remaining of Faceville Field. 3 miles south of Faceville, GA. Thanks to Brian Rehwinkel for pointing out this airfield. A 1929 aerial view looking east at Dale Mabry Field. 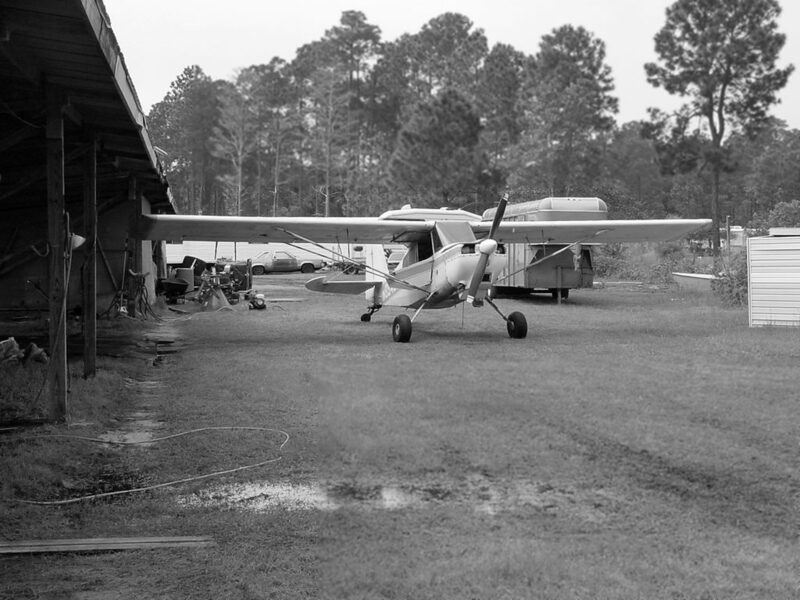 The City of Tallahassee purchased a 200-acre tract for its first municipal airport in 1928.
and the airfield (one grass runway) was built with the assistance of federal WPA funds. killed while commanding the Army semi-rigid airship Roma which crashed on 2/21/22 at Norfolk, VA. The new airport was dedicated on 11/11/29, and the first manager was Ivan Munroe. Atlantic Gulf Coast Airlines began commercial flights at the new airport during its first month. 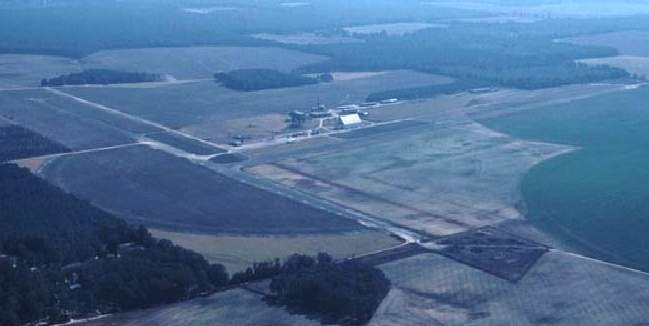 showing an irregularly-shaped grass field with a single hangar on the northwest side. 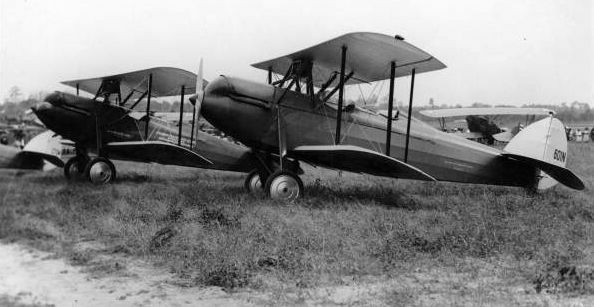 A 1929 photo of several unidentified biplanes at Dale Mabry Field's grand opening. Airport manager Ivan Munroe began giving flying lessons at the new airport in the early 1930s in a Travelaire. described Dale Mabry Field as having 4 sod runways, with the longest being 2,600'. Dale Mabry Field, as depicted on the November 1936 "Official Airway Map of FL" (courtesy of Chris Kennedy). The directory described Dale Mabry Field as having two 2,400' paved runways, under construction. A single hangar was depicted on the northwest corner of the airfield. The operator was listed as Ivan Munroe. 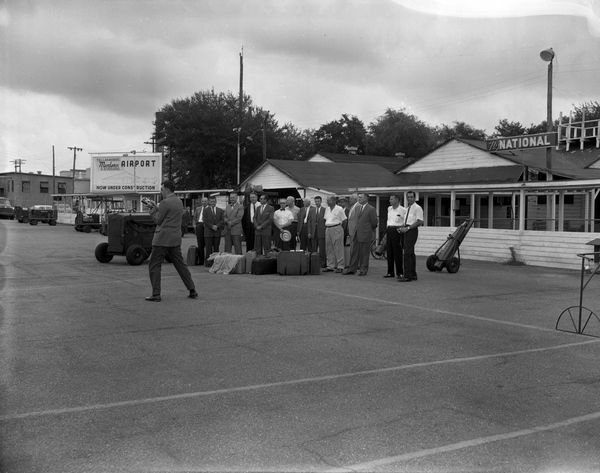 on the occasion of the first scheduled airline service into Tallahassee. with 4 daily flights to Memphis, Birmingham, and Montgomery. offering flights to Jacksonville, Pensacola, Mobile, and New Orleans. 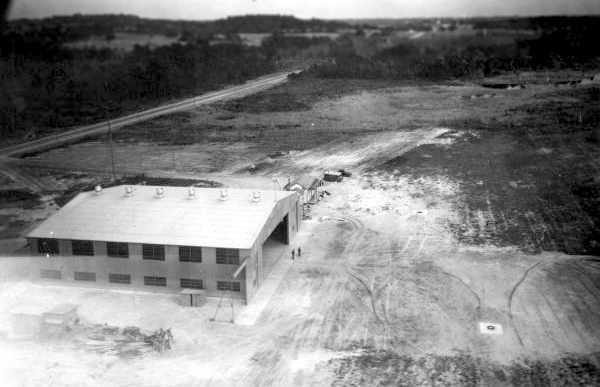 A circa 1930s aerial view of a hangar at Dale Mabry Field. This had been built by the WPA with material bought by the city. and developed 3 runways to serve their needs. 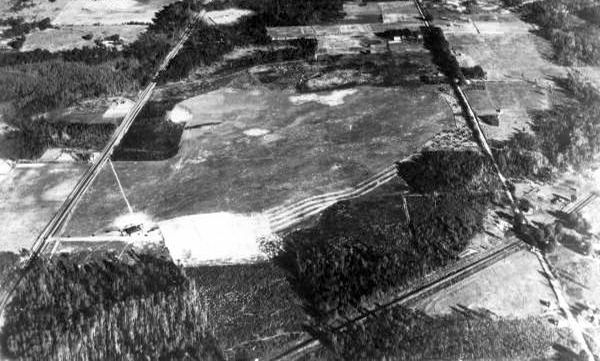 An aerial view of Dale Mabry Field from The Airport Directory Company's 1941 Airports Directory (courtesy of Chris Kennedy). Compare this view with the 1937 aerial photo above, to see how dramatically the airport had been expanded in 4 years. The field was described as having 2 paved runways (4,000' northwest/southeast & 2,500' north/south), along with a 3,400' sand & sod east/west runway. A single hangar was depicted on the field. The manager was listed as Ivan Munroe, and the operators were Ivan Monroe, Eastern Air Lines, and National Air Lines. Dale Mabry Field became an Army base in 1941 & aircraft & trainees arrived in May that same year. included the P-39 Airacobra, P-40 Warhawk, and P-47 Thunderbolt. The 1940 USGS topo map depicted the configuration of the “Municipal Airport”, with 3 paved runways & a few small buildings. 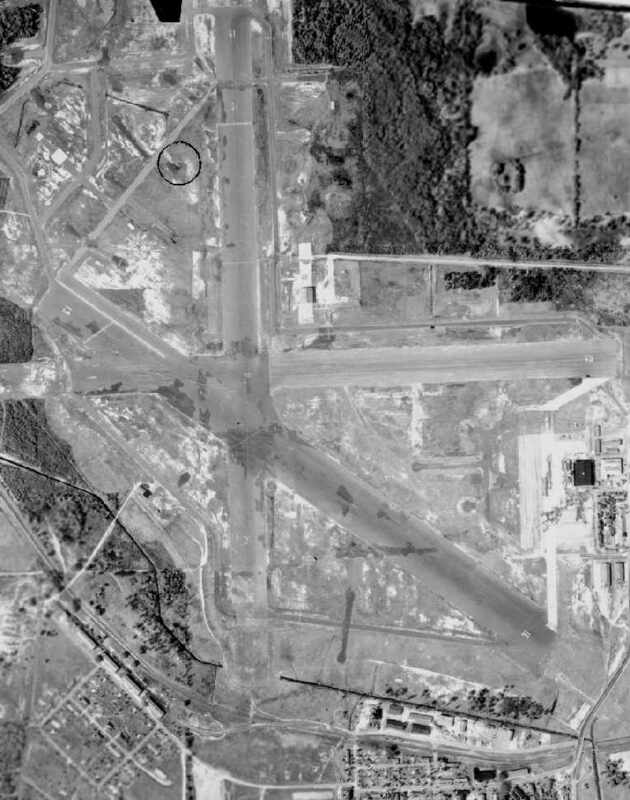 A 1942 aerial view of Dale Mabry AAF. Chinese & French cadets also trained at Dale Mabry Field in 1942 & 1944.
the commercial airlines (Eastern & National) continued to use the field during the war. Training on the P-51 Mustang fighter occurred at Dale Mabry later in the war. Originally 530 acres, the airfield grew to 1,720 acres & 133 buildings during the course of the war. 3,000 enlisted men & women, and 800 civilian employees. and, tragically, more than a dozen pilots died in training accidents. Students used a gunnery base at Alligator Point & a bombing range at Sopchoppy on the Gulf for their training needs. 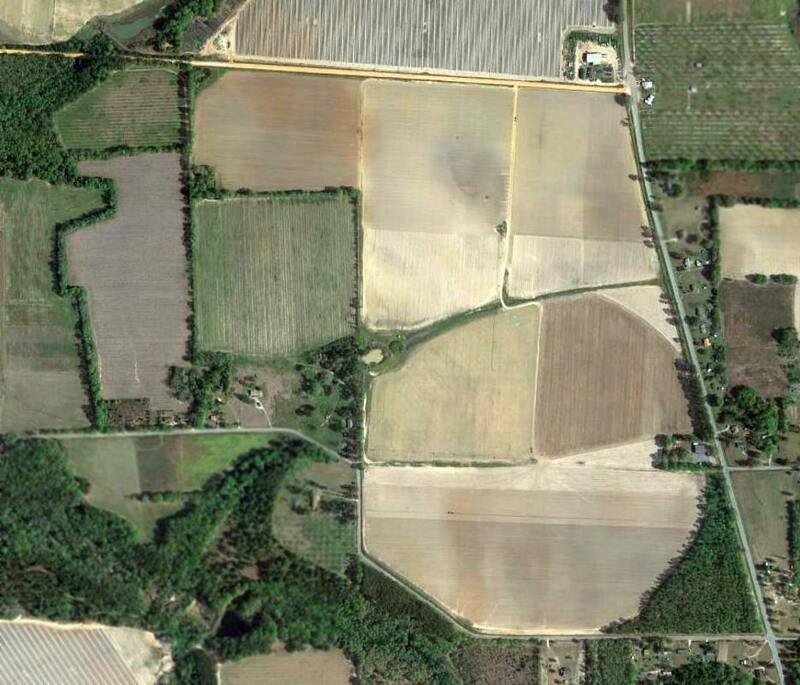 Mabry had satellite fields at Thomasville & Harris Neck, GA. The pilots also utilized auxiliary bases in Perry, Alachua, Cross City & Dunnellon. A branch Prisoner of War compound at Mabry held 150 POWs who worked on the base. 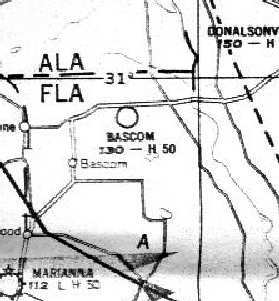 Dale Mabry AAF, as depicted on the February 1945 Mobile Sectional Chart (courtesy of Chris Kennedy). 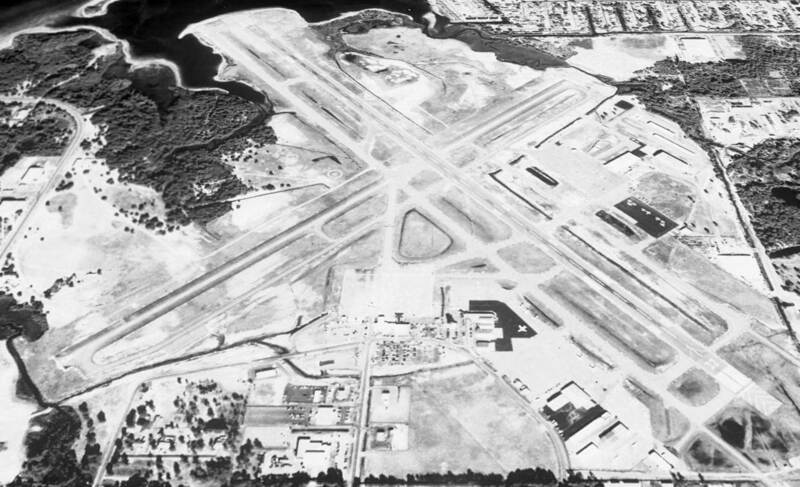 Dale Mabry AAF was placed on inactive status in 1945, and eventually resumed its role as a civilian airport after WW2. 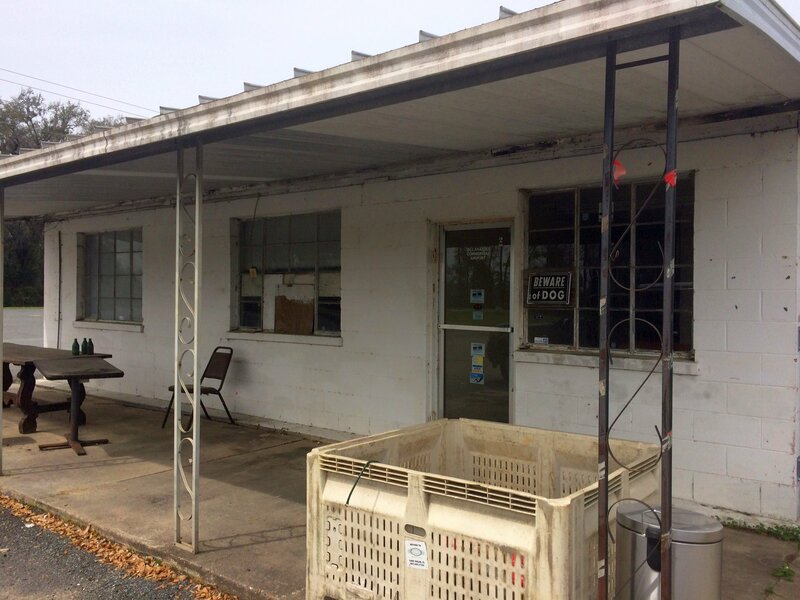 reassembled & used as a warehouse & office for the Tallahassee Electric System. 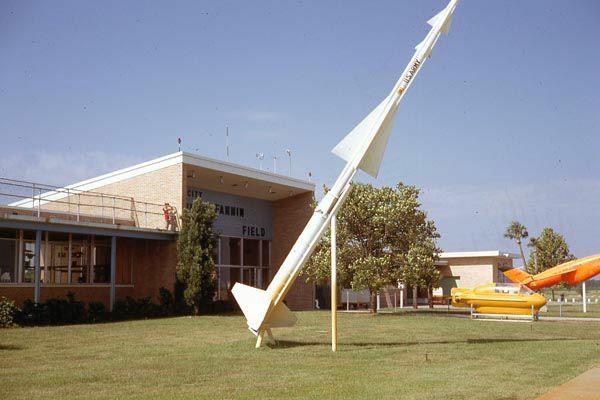 Later it was moved again to the new Tallahassee Municipal Airport. after it had been returned to the City of Tallahassee (courtesy of the FL DOT, via Brian Rehwinkel). A 1956 photo of the Dale Mabry terminal (courtesy of David Henderson). 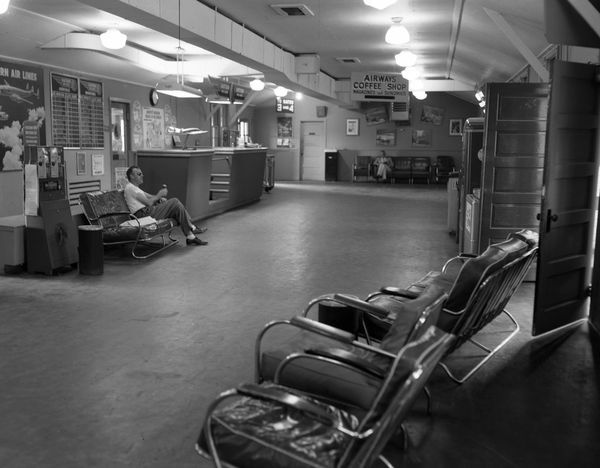 A 1956 photo of the interior of the Dale Mabry terminal (courtesy of David Henderson). only one year before the airfield was closed. of numerous planes on the ramp at Dale Mabry. 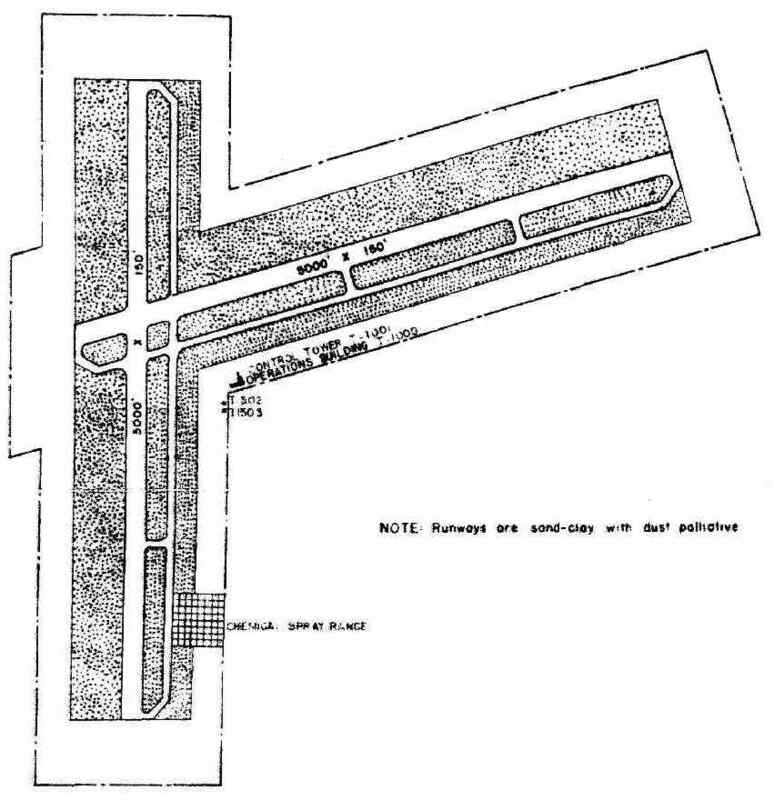 Dale Mabry Field, as depicted in its very last year of operation, in the 1960 Jeppesen Airway Manual (courtesy of Chris Kennedy). The field was depicted as having 3 paved runways, with the longest being the 5,243' Runway 12/30. 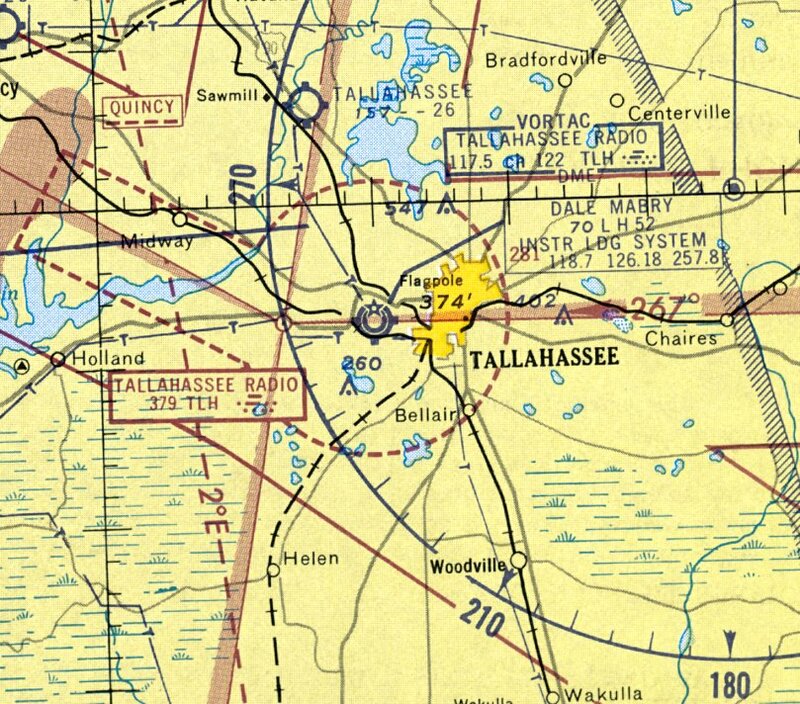 The last aeronautical chart depiction which has been located showing Dale Mabry Field in operation was on the March 1960 Mobile Sectional Chart. 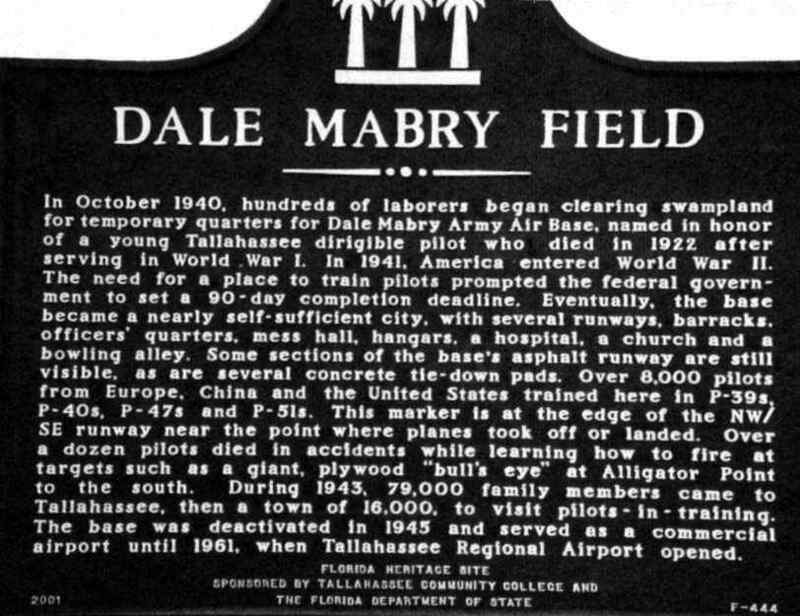 It depicted Dale Mabry Field as having a 5,200' paved runway. Dale Mabry Field was abandoned in 1961, when a new Tallahassee Airport was built several miles to the southwest. According to Rick Bell, Dale Mabry Field's Runway 9/27 was reused as a drag strip following the airport's closure. A summer 1962 photo by Rick Bell looking east at “Dale Mabry Field, when Runway 9/27 was converted into Seminole Drag Strip”, with hangars & the control tower visible in the background. Rick recalled, “One dragster, whose chute failed to open properly ran off of the end of the strip, jumped the road & crashed into a chain link fence. One weekend it rained severely in the morning but turned sunny by the afternoon so everybody showed up even though it had been called off. 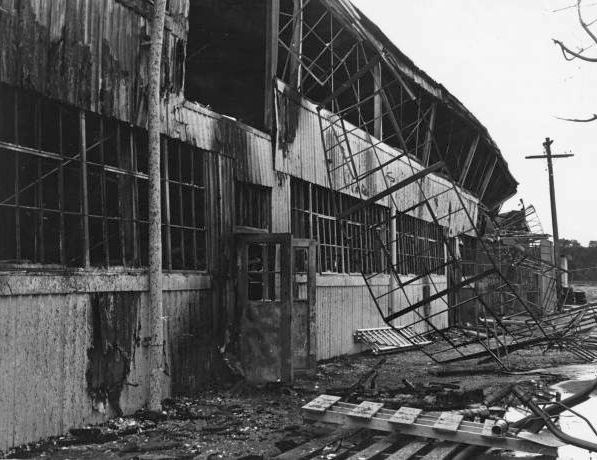 A 1960s photo of a hangar destroyed by fire at Dale Mabry Field. 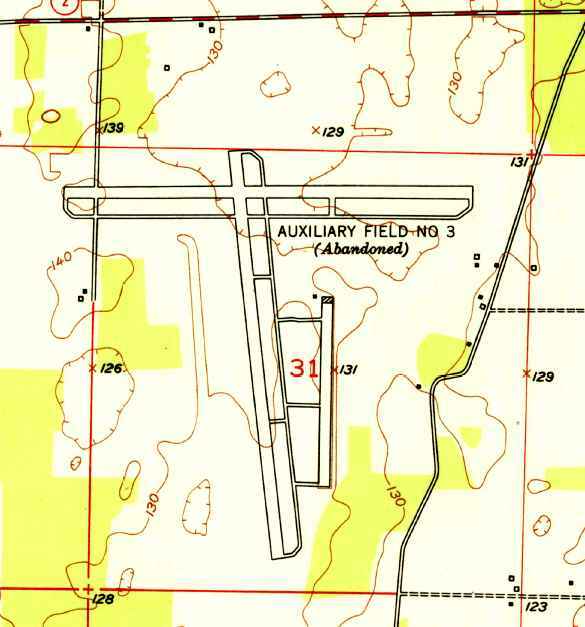 The 1964 Mobile Sectional Chart (courtesy of John Voss) depicted the site of the field as "Aband airport". 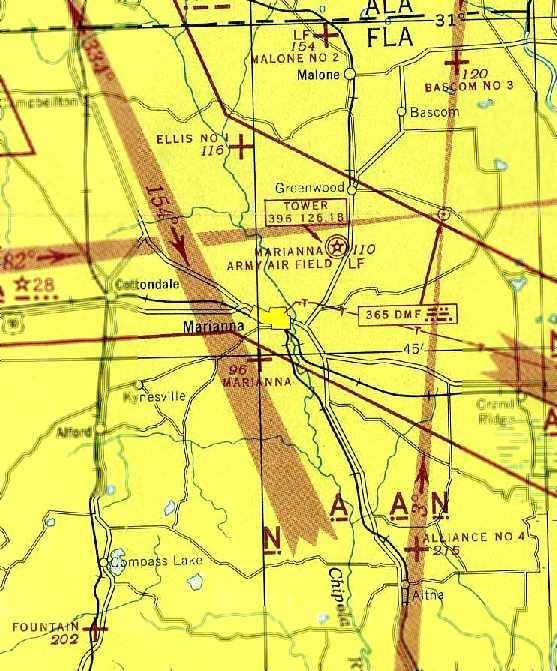 The 1966 USGS topo map continued to depict the “Municipal Airport” as having 3 paved runways & a few small buildings. However by the time of the 1972 USGS topo map the runways & airport buildings had disappeared from the depiction. showing the redevelopment of the property in progress. Several roads had been built directly over the former runways, the outlines of which were still perceptible. 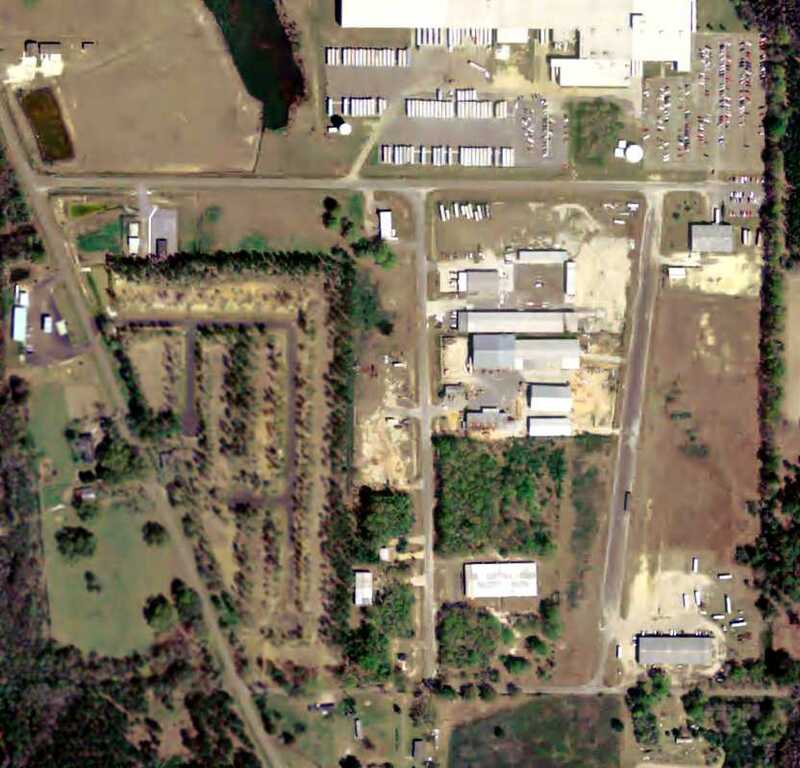 The buildings of the Tallahassee Junior College had begun to cover the north end of the former airfield. the Florida Highway Patrol Training Academy, and a variety of other public & private applications. 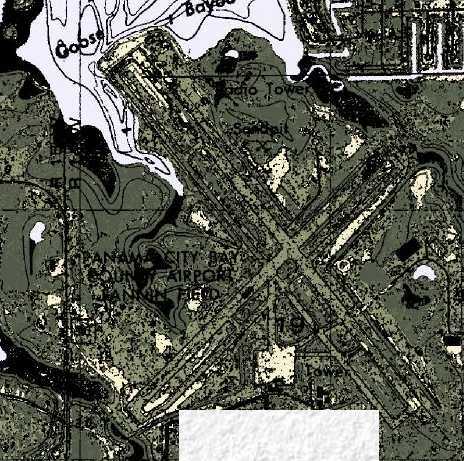 The 1976 USGS topo map (courtesy of William Stanton) still outlined the runway layout of the former Dale Mabry Field. which runs in front of the TCC campus. My calculations indicate that Appleyard Road is virtually superimposed over the north/south runway of the old Dale Mabry Field." Richard Travis continued, "Some remnants of the runways are still in much evidence. is a patch of aging pavement, sometimes used for over-flow parking, which once was part of the north/south runway. A commemorative plaque designating Dale Mabry Field was erected at the site & dedicated during a ceremony in October 2001." "To the southeast of this location, in the lower right quadrant of [the above] photo, are some additional remnant patches of runway. This area along Jackson Bluff Road contains a sports complex with numerous ball fields - the 2 circles forming a figure 8.
commonly understood to be runway remnants, and my figures indicate it was once part of the northwest/southeast diagonal runway." memorializing the Dale Mabry Air Field & the pilots that served there. The sculpture will be permanently on display in the second-floor Observation Room of the Ivan B. Munroe Terminal. A 2004 photo by Richard Travis of the historical marker at the northwest corner of the intersection of Pensacola Street & Appleyard Road. and the airfield opened in 1929, whereas the plaque seems to indicate that it was established in 1940.
which by then served as a parking lot for the Jim Messer Sports Complex. Note the wear grooves in the former runway pavement, aligned with the longitudinal direction of the runway. Craig Hiers reported in 2005, “I grew up on what was the old Dale Mabry Airport. The community we lived in was called Mabry Manor, and all the streets were named after military generals & admirals. with the commemorative plaque, has been paved over (blacktop) and is now an active parking space for the school. 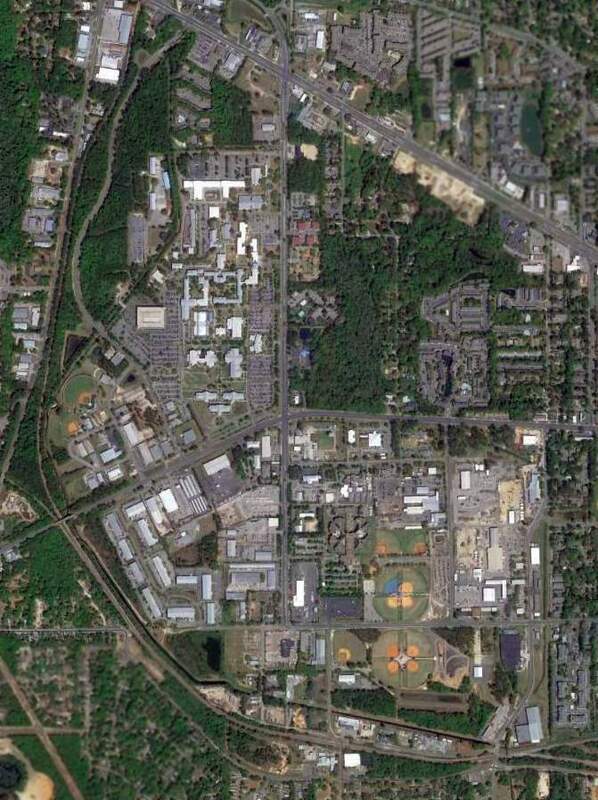 A 4/1/13 aerial photo of the site of Mabry AAF, now the campus of the Tallahassee Community College. The site of Mabry Field is located northwest of the intersection of West Pensacola Street & Appleyard Drive. 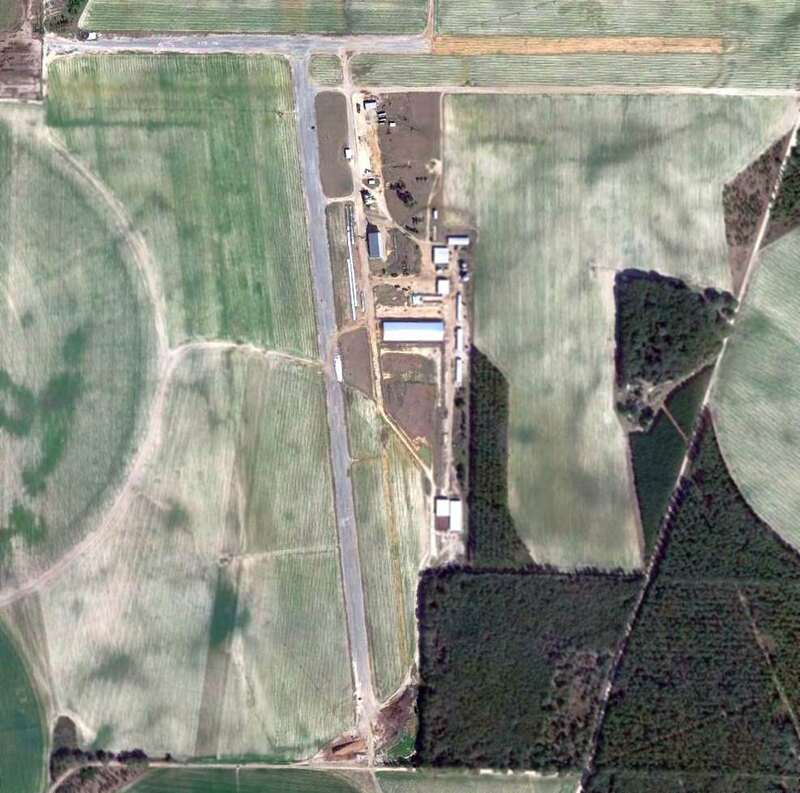 Thanks to Lawrence Sharp (who once flew out of Mabry) for pointing out this airfield. which conducted training of light bomber crews. according to a 12/31/45 Inventory of U.S. Army "Owned, Sponsored, and Leased Facilities" (according to Chris Kennedy). was a 7/23/43 aerial view looking northwest from the 1945 AAF Airfield Directory (courtesy of Scott Murdock). It depicted “Mariana AAF Auxiliary #1 (Ellis Field)” as having 2 asphalt runways, each with a parallel taxiway. A 1944 map (courtesy of Ron Plante) depicted the location of the 4 Auxiliary Fields relative to Mariana “Main Field”. as a 977 acre T-shaped property having 2 asphalt 5,000' runways, oriented northeast/southwest & NNW/SSE. The field was said to not have any hangars, to be owned by the U.S. Government, but not to be currently in operation. was on the February 1945 Mobile Sectional Chart (courtesy of Chris Kennedy). 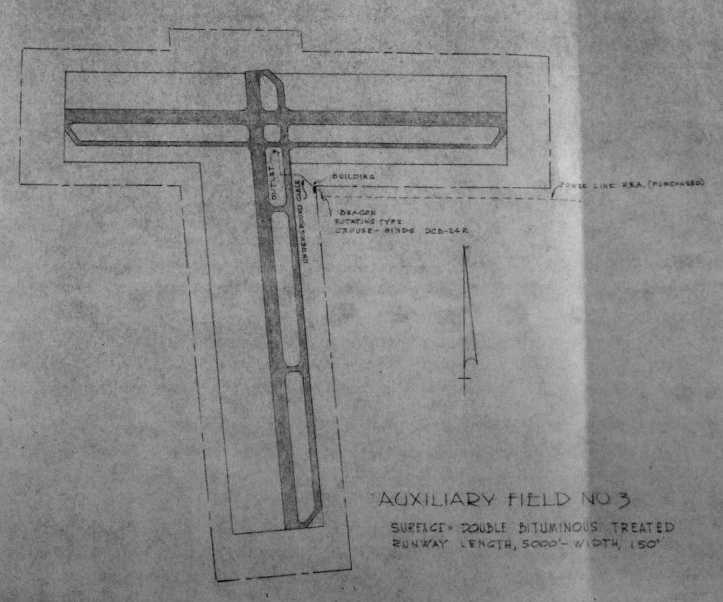 A WW2-era layout map for for Ellis Auxiliary Field # 1 (courtesy of the National Archives, via Brian Rehwinkel). It depicted the field as having two 5,500' "sand-clay with dust palliative" runways. along with a control tower & an operations building. 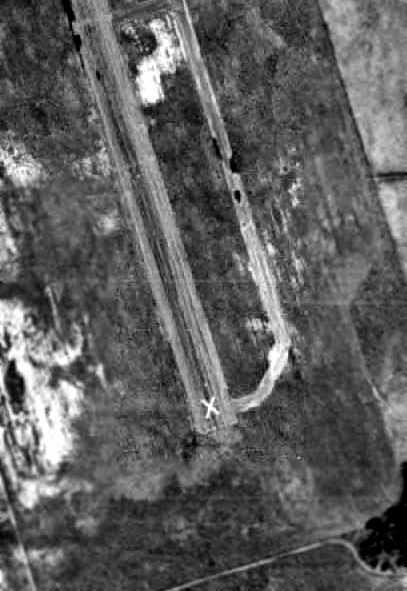 A close-up of the closed-runway "X" symbol on the Ellis runway, from the December 1948 USDA aerial photo. 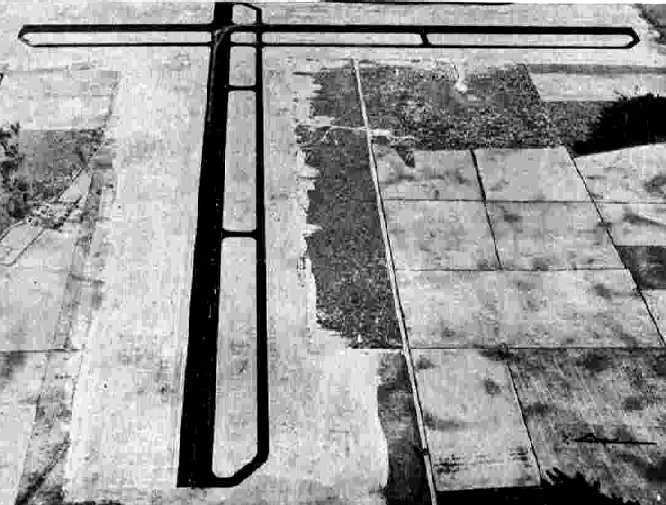 as both runways were marked with closed-runway "X" symbols in the above December 1948 aerial photos. with the east/west runway having a parallel taxiway along the south side. There did not appear to have been any buildings associated with the airfield. was in poor condition by 1948 - only 5 or 6 years after they were built! 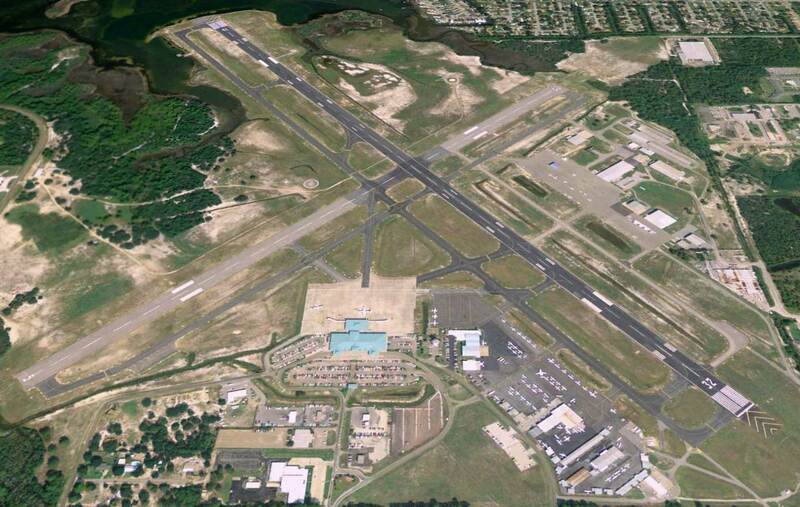 You can see from the photo the northeast/southwest runway appears to be quite deteriorated." the Ellis airfield was no longer depicted at all. with a parallel taxiway on the southeast side & a single small building on the east of the runway intersection. 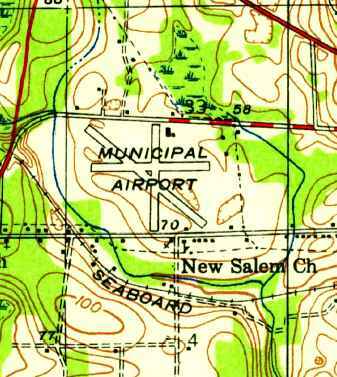 The 1973 USGS topo map continued depicted the airfield as having two 4,100' paved runways. By the time of the 1983 USGS topo map, nothing of the airfield was still depicted. Brian Rehwinkel recalled in 2004, "I have visited this site before & spoken with the owner of the property. He told me the runways were removed many years ago. there is nothing left of the runway except small bits & pieces of asphalt. The remaining portion of the airfield has been replaced by plowed fields. I believe the wooded portion has been used by a hunting club." 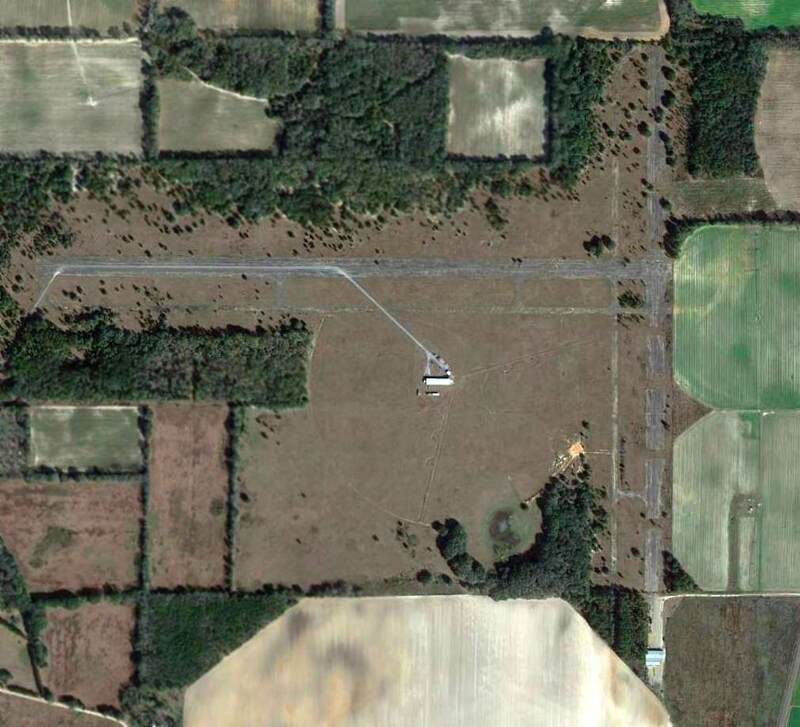 A 2/2/13 USGS aerial photo showed the outline of a 2,500' section of the south end of the north/south runway & its parallel taxiway remained quite distinctive. but still bore faintly recognizable traces of the runway layout. 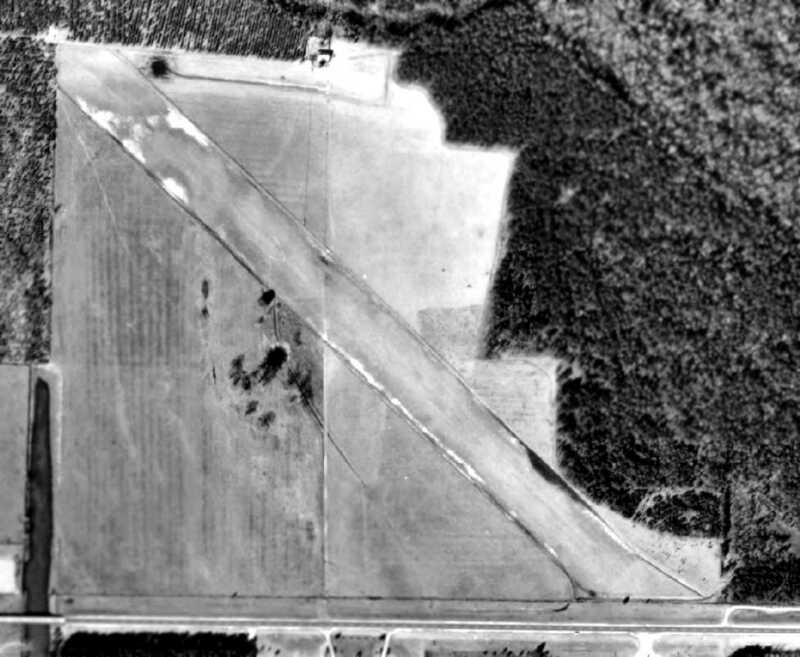 This military airfield was built during WW2 as one of 4 satellite airfields for Marianna AAF, which conducted training of light bomber crews. but its parent airfield (Marianna AAF) was opened in late 1942, and its auxiliary fields were apparently built in late 1942 or early 1943. The airfield cost $329,000 to build, plus $30,000 to purchase its 519 acres of land. was a 2/27/43 aerial view looking east from the 1945 AAF Airfield Directory (courtesy of Scott Murdock). It depicted “Mariana AAF Auxiliary #2 (Malone Field)” as having 2 asphalt runways, each with a parallel taxiway. 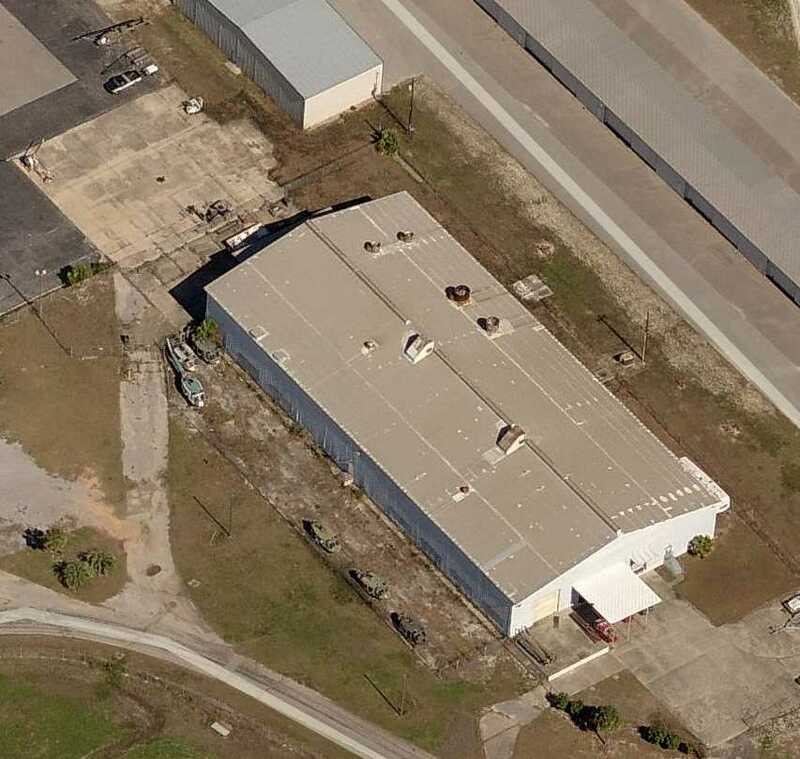 and a 20' x 30' building to the southwest of the runway intersection. as a 613 acre T-shaped property having 2 asphalt 5,000' runways, oriented north/south & east/west. (as there were no signs of use, and it appears a road had been cut across the north/south runway). Malone #2 was not depicted at all on the 1949 Mobile Sectional Chart (according to Chris Kennedy). (a USAF Contract School which operated at the former Marianna AAF from, I believe, 1952-61). but apparently this field was used during that time." 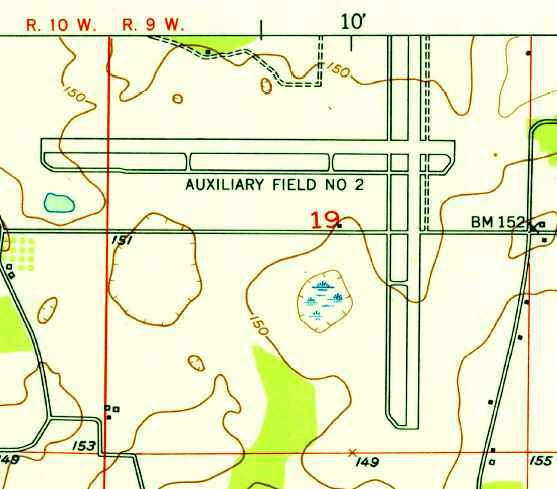 The 1953 USGS topo map depicted “Auxiliary Field #2” as having 2 paved perpendicular runways with parallel taxiways. and described it as having 2 paved runways, although with the note "Emergency use only". a LORAN-C navigation radio station, with a 300' tower southwest of the runway intersection. 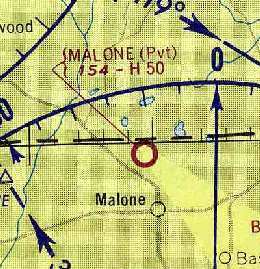 Malone was depicted as an abandoned airfield on the 1980 New Orleans Sectional Chart (courtesy of Robert Brown). with the radio tower labeled to the southwest of the former runway intersection. 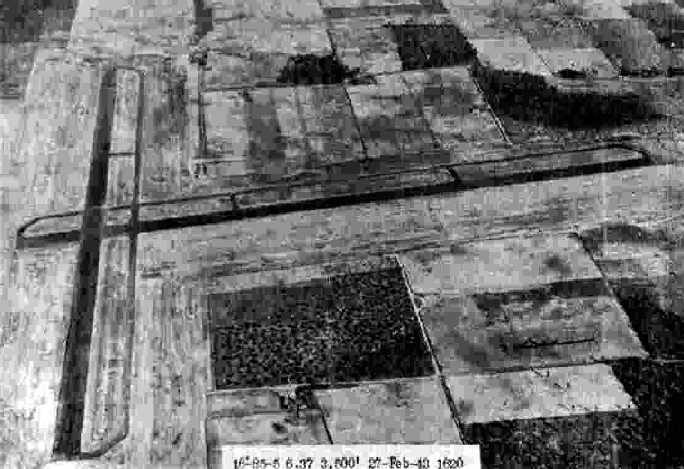 Only a small western portion of the east/west runway was still depicted. as the LORAN system was increasingly replaced by GPS. 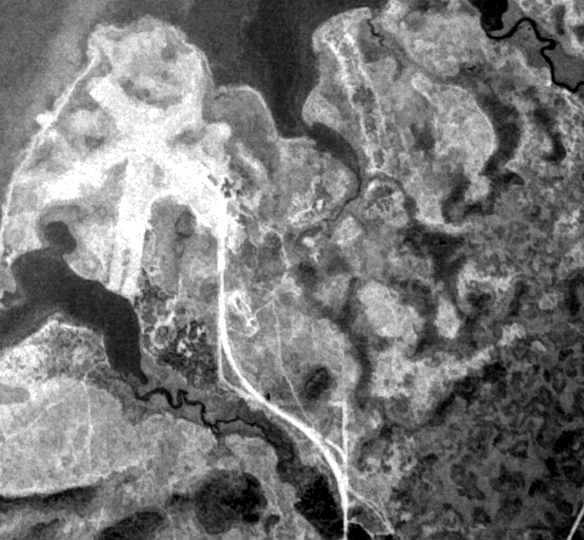 A 2/2/13 aerial view showed that the majority of Malone's WW2-era runways remained intact, along with the former Coast Guard LORAN installation to the southwest of the runnways. and its auxiliary fields were apparently built in late 1942 or early 1943. 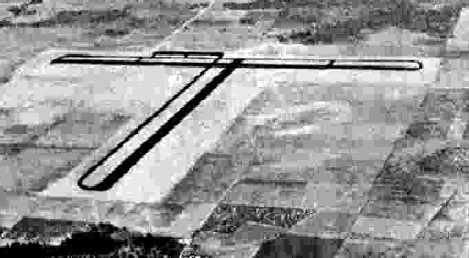 It depicted “Mariana AAF Auxiliary #3 (Bascom Field)” as having 2 asphalt runways, each with a parallel taxiway. and a building & beacon to the southeast of the runway intersection. Mel Shettle’s book “Florida’s Army Air Fields of WWII” stated that P-40 fighter aircraft were based at Bascom Field to keep them separated from the AT-6 training aircraft at Marianna AAF. 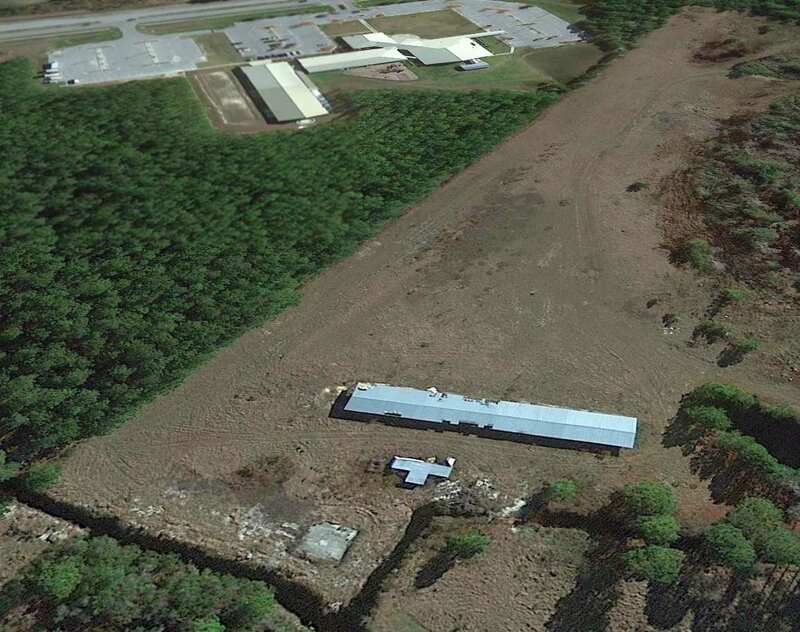 as a 717 acre T-shaped property having 2 asphalt 5,000' runways, oriented east/west & NNW/SSE. The field was said to not have any hangars, to be owned by the U.S. Government, and operated by the Army Air Forces. Notably, Bascom was the only field among Mariana AAF's 4 auxiliary fields which were still in operation at this point. 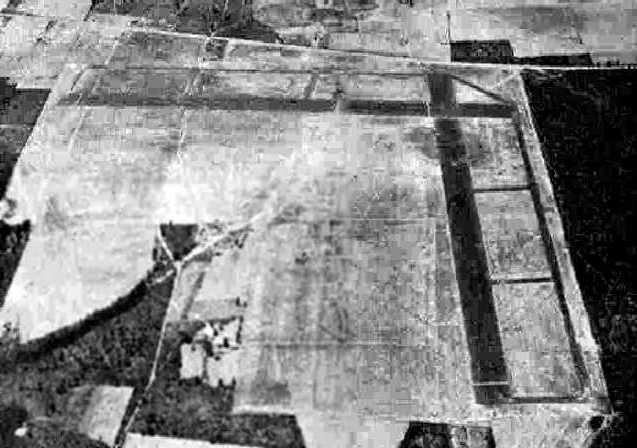 The the Bascom airfield consisted of 2 paved runways, each of which had parallel taxiways. which appeared to have at least one building (a hangar?). and there were no closed-runway "X" symbols on the runways. 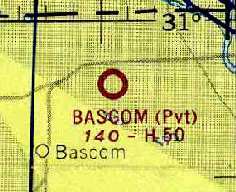 as it was labeled simply as "Bascom" on the 1949 Mobile Sectional Chart (courtesy of John Voss). and paved ramp with one small building on the southeast side. and described as having a 5,000' hard-surface runway. and described it as having 2 paved runways, and the note "Emergency use only". as it was not depicted at all on the 1980 New Orleans Sectional Chart (courtesy of Robert Brown). 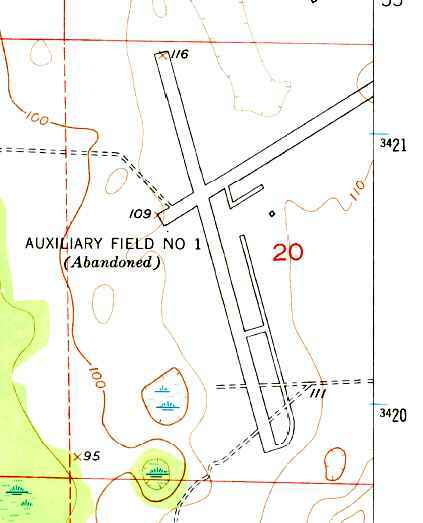 The 1982 USGS topo map continued to depict the abandoned airfield in the same fashion as depicted in 1953. It was depicted on 1997 USGS topo map as "Auxiliary Field #3". Brian Rehwinkel recalled in 2004, "I have actually been on that airfield (about 5 years ago) and it was being used by crop dusters. The airfield was owned by North American Farms. must have been an accomplished pilot (or very lucky)." taken from the back seat of Richard Stumpf's Tandem Airbike ultralight. "used for crop dusting operation & owner's private use." and the field consists of a single 4,400' asphalt Runway 18/36, "in good condition". 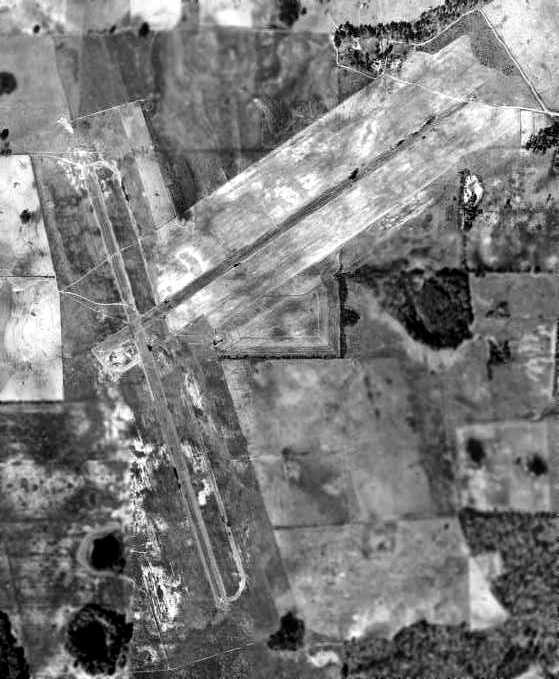 A 2/1/13 aerial photo showed the WW2 era runways of Bascom Field remained mostly intact. was a 7/23/43 aerial view looking west from the 1945 AAF Airfield Directory (courtesy of Scott Murdock). 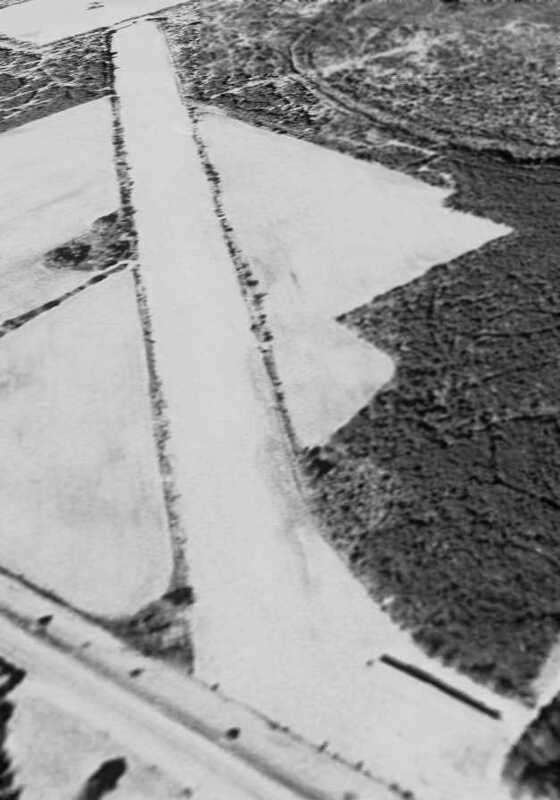 It depicted “Mariana AAF Auxiliary #4 (Alliance Field)” as having 2 asphalt runways, each with a parallel taxiway. and a building to the southwest of the runway intersection. 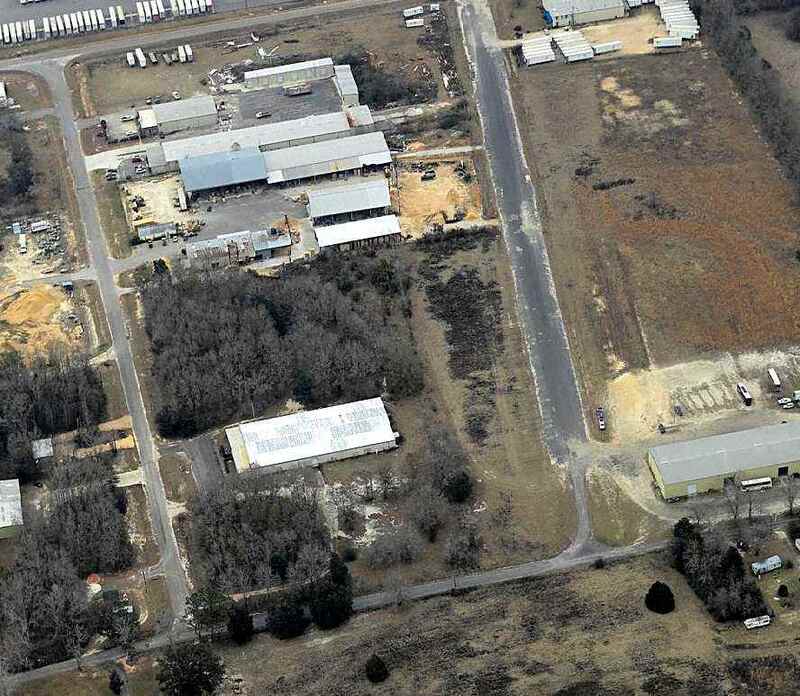 as a 1,960 acre square-shaped property having 2 asphalt 5,000' runways, oriented north/south & east/west. Notably, this field was over twice the acreage of the 3 other Mariana AAF auxiliary airfields. Alliance Field was said to not have any hangars, to be owned by the U.S. Government, but not to be currently in operation. as both runways were marked with closed-runway "X" symbols. each of which had a parallel taxiway. It is not known if the airfield originally had any buildings or hangars. 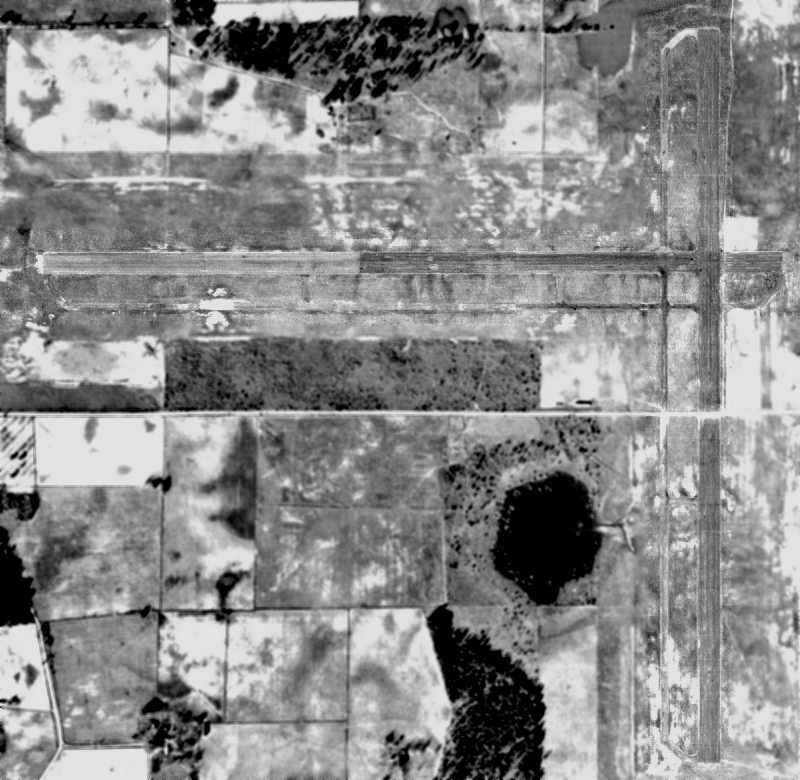 A 2/14/57 USDA aerial photo of Alliance Aux #4 (courtesy of the FL DOT, via Brian Rehwinkel). with just traces still perceptible of the remainder of that runway & the former east/west runway. and there is no obvious evidence there was ever an airfield at that site." 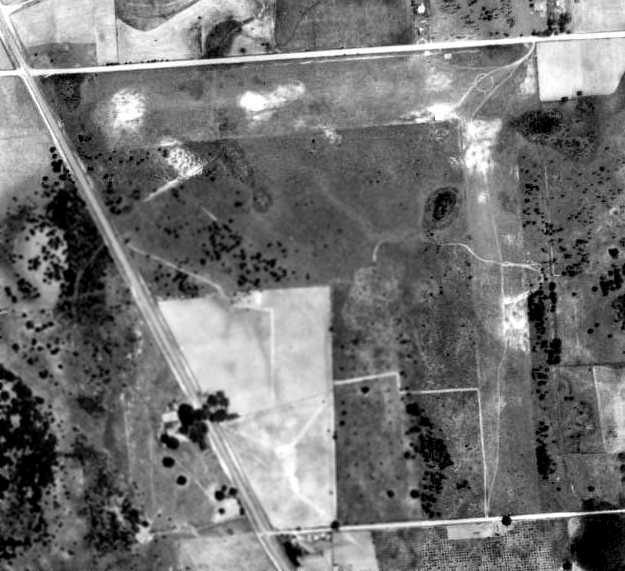 A 2/1/13 aerial photo showed the runways had been removed, with the property reused for farming. will reveal the "ghosted" outline of a section of the east/west runway & its parallel taxiway. The site of Alliance Aux #4 is located southwest of the intersection of Alliance Road & Jesse Lane.